It all started in 2013 when I first fell in love with this so called Urban-SUV. Four years gone and now I continue to be in love with it. However, this love story has a sweet twist. The machine I love has undergone a thorough make over and I have upgraded to the Titanium variant of the 2017 facelift. My first Ecosport 1.5L Diesel, Trend variant bought in 2013 served me well for 4 years (57000+ Kms) without a fuss. Apart from the periodic maintenance the only other parts that were replaced were the wipers and the battery after 3 years and 6 months of use. As per the service advisor the MRF tyres will still last a good 15000kms which I guess is a good mileage for the tyres. Overall fuel efficiency was 17.3Kms/litre for the entire 57000+ kms that I drove with 65:35 city and Highway usage. The car is now with my brother and thus stays within the family. I was so bonded to it that I felt very sad when I bid goodbye but happy that I will get to ride it when I visit my brother. The ownership review can be read here. There was no apparent reason for change other than to take a car lease option from the company that helps me save on tax. I was confused whether to upgrade to a full grown SUV or to stay with the sub-four metre class. Based on my need and financial commitments, I decided to upgrade within the sub-four metre category / with something which had an ex-showroom price of less than Rs. 10 lakhs. The powertrain was definitely going to be a Diesel. 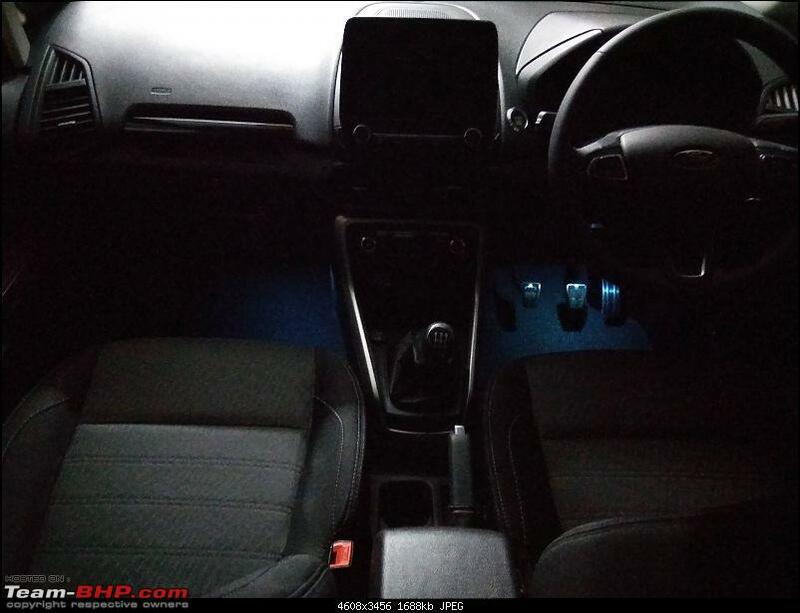 Pre-facelift Ecosport (upgrade to Titanium), S-Cross (Zeta Variant), WRV (Top end Diesel), Nexon (XZ+), TUV300 (T10). 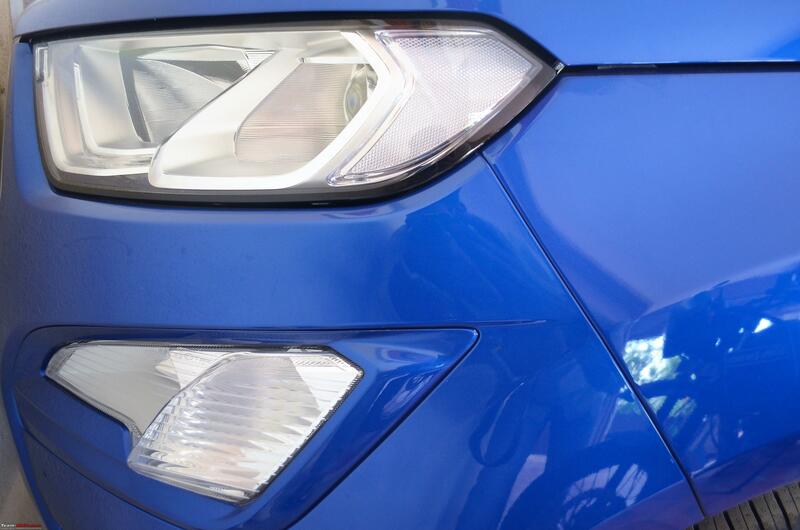 After trying all of them I decided to go with the pre-facelift Ecosport (Titanium variant). With the facelift around the corner and being a returning customer I was offered good discounts but after I booked they told me that the only Mars Red car that was available got sold to another customer just a few hours before I booked. The other colours didn’t impress me and I decided to cancel. At that point, the facelift just seemed like a cosmetic upgrade and the looks of the facelift didn’t impress me like the looks of the outgoing model did. 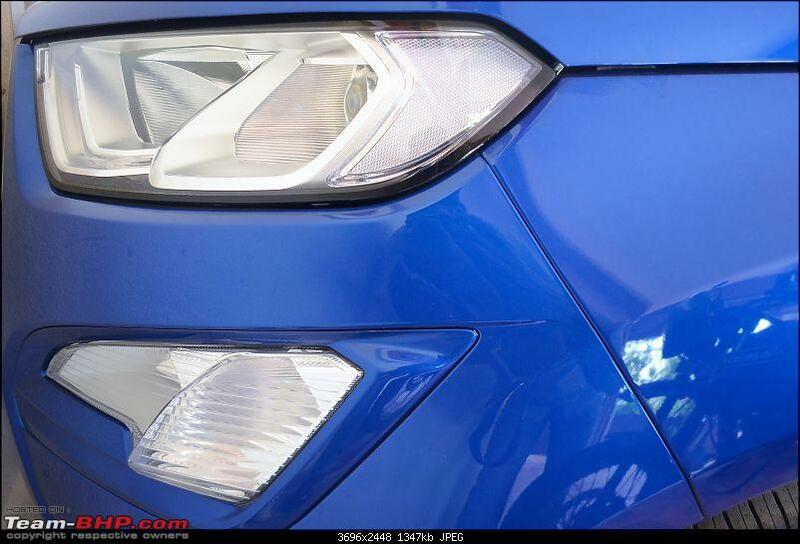 It was then when credible reports on the facelift started to emerge and it seemed that Ford has not only done cosmetic changes but also worked on sorting out the issues with the outgoing variant. After lot of reading and research finally pre-booked the facelifted Titanium variant and was eagerly waiting for the price to be revealed. 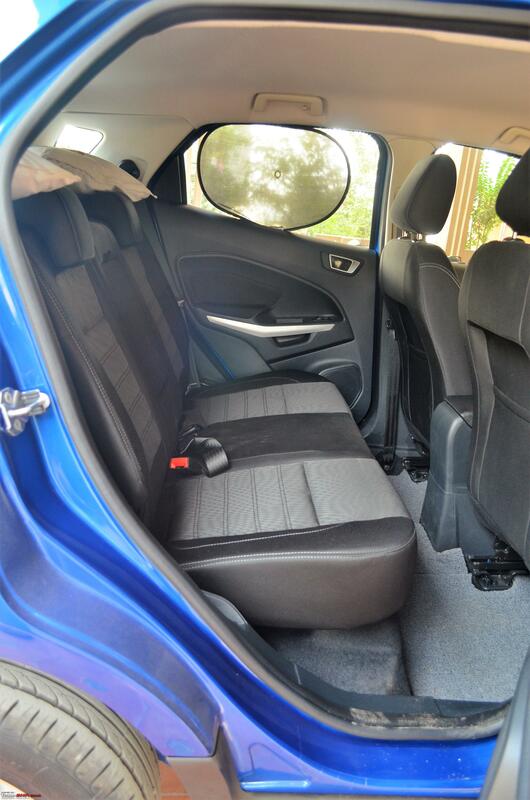 However, I had the S-CROSS (Zeta Variant) as a fall back option in case the facelifted EcoSport diesel Titanium costed more that 10 lakhs ex-showroom, Chennai. 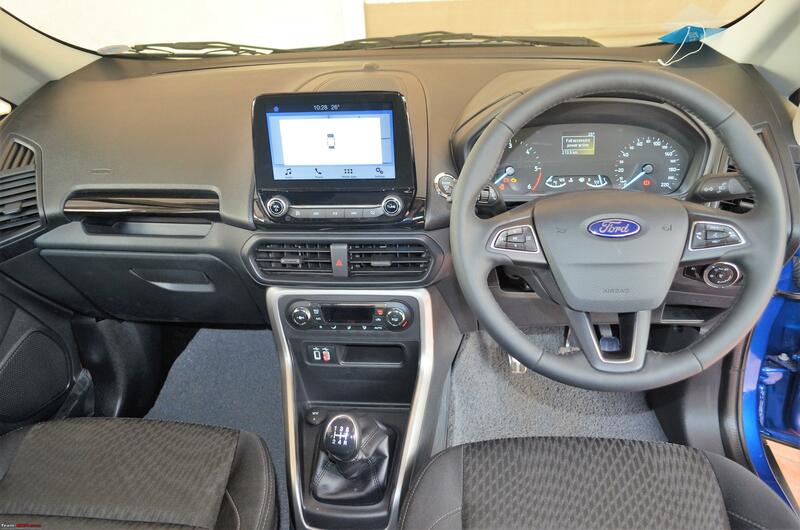 It has its strengths in the form of cruise control, inbuilt navigation, all wheel disc brakes, fatter tires and sliding arm rests. They are cool features for the pricing. However, the 1.3L Smart Hybrid Diesel lacked the drivability and grunt of the 1.5L Diesel of the Ecosport and also couldn’t match the SUVish looks the Ecosport has. The facelift was launched on the 9th of November and prices remained unchanged which meant that I could go ahead with my booking. The car was available on the 1st of December and took delivery of the car on the 19th of December and here starts my ownership review. 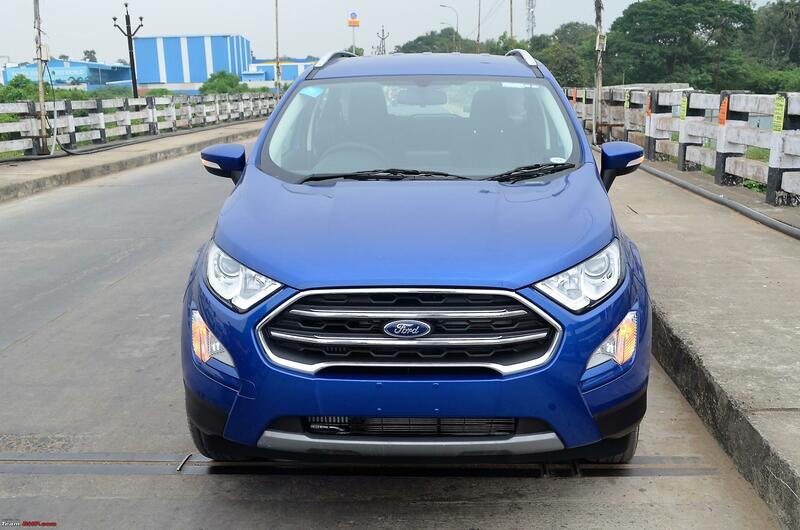 As an ownership thread, I shall start with the focus on the car, the All-New Ford Ecosport Diesel Titanium variant and later cover what made me choose this over the other options considered. 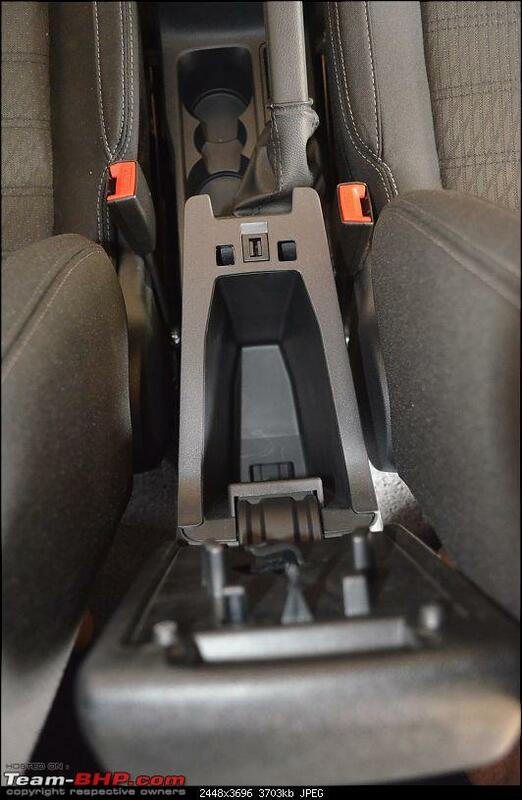 •	Absence of the ISOFIX even on the Titanium variant. 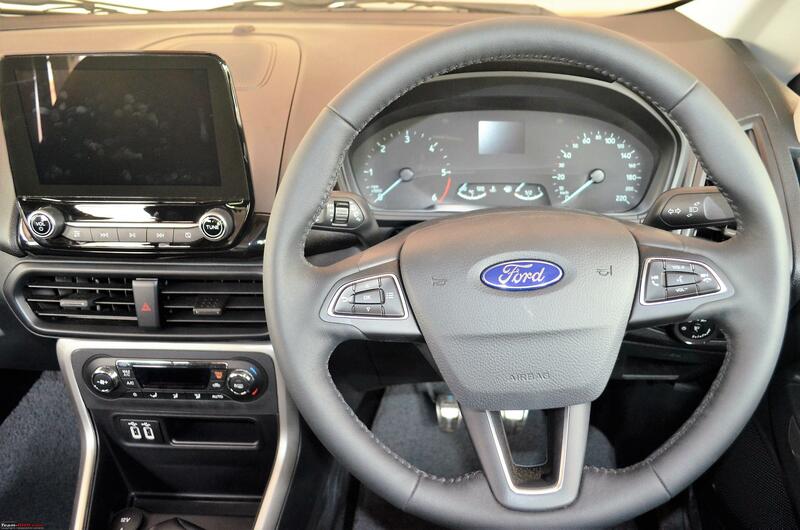 •	The instrument cluster is the worst looking in the segment. 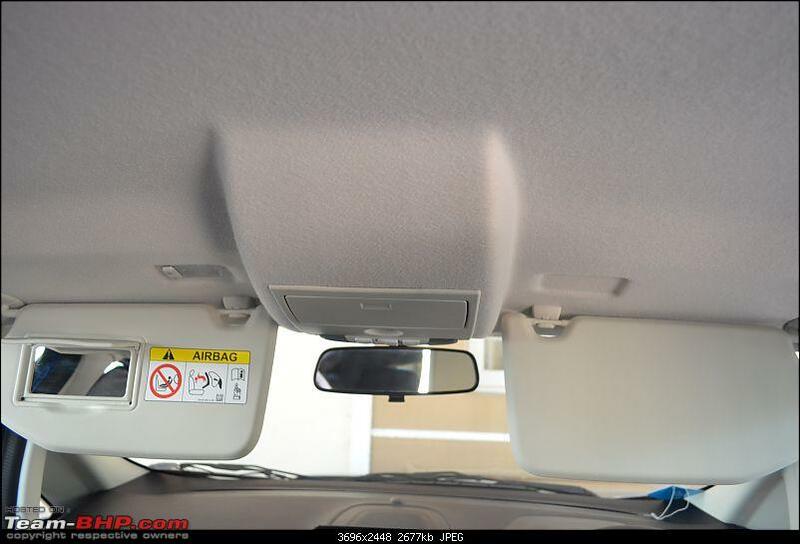 The display in the cluster is the only glaring cost cutting seen; unfortunately in a place where the driver will often see while driving. SHAME on you Ford. Firstly, is the facelift worth it? I did the purchase at a time when there were good discounts on the outgoing model and there was this confusion whether to take those discounts or to go ahead a buy the facelift. 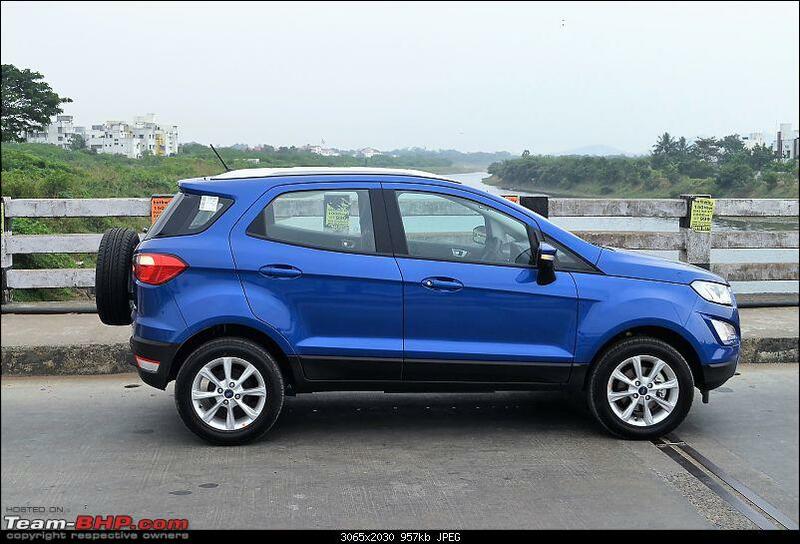 Being an Ecosport owner already, I was very happy with the old one and financially the discounts did sound worthy. I did book the old one with discounts but unfortunately couldn’t get the Mar Red colour and hence had to go for the facelift. 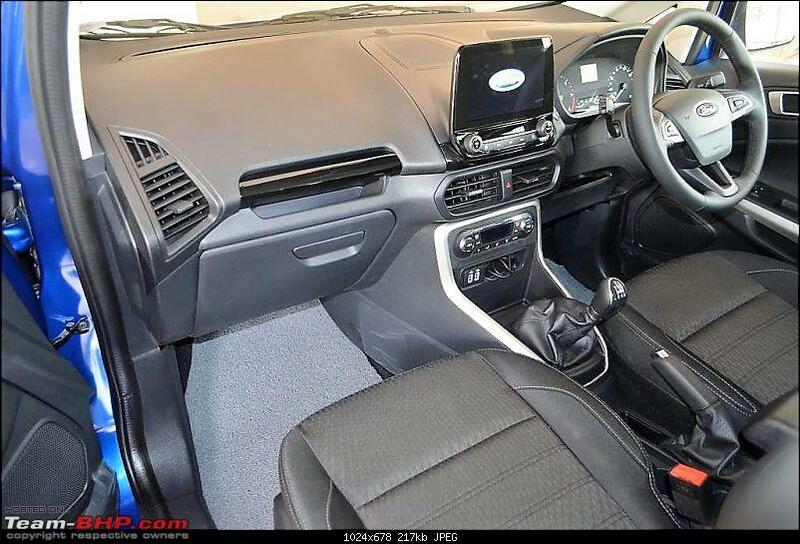 But today, I am glad I chose the facelift as Ford has worked on almost every bit of improvement that the customers wanted. The ones that really make a difference are the ride quality, broader seats, smoother gears and the 8” touch screen. These improvements do enhance the user experience to new levels and is definitely worth it. Last edited by Jude300 : 15th January 2018 at 10:25. The new front grille is refreshing but to me does not appeal as much as the old one. The black grille on the ambient version looks cooler than the chrome one. The bumper applique does look good and is a standard fitment on the Titanium and Titanium+ variants. The Auto-folding ORVM is a new feature and is very useful. It opens when you unlock the car and closes when the car is locked. Notice the air deflector for better drag co-efficient. 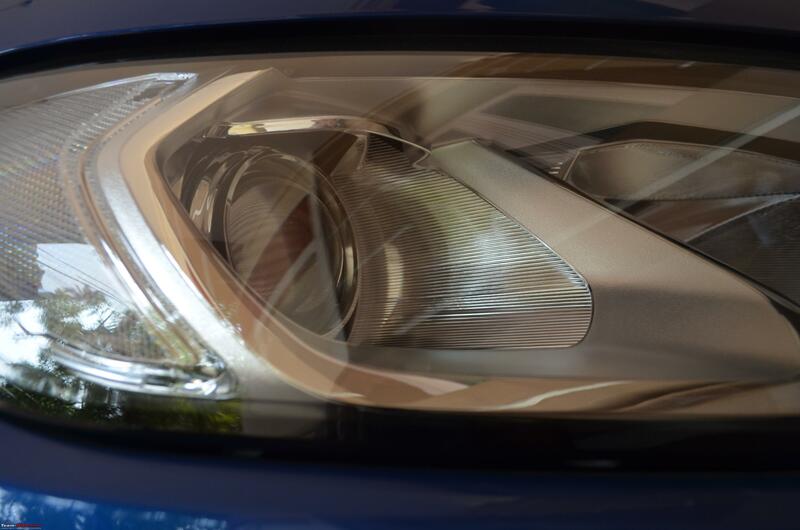 The projector headlamp cluster looks sharper and neat. 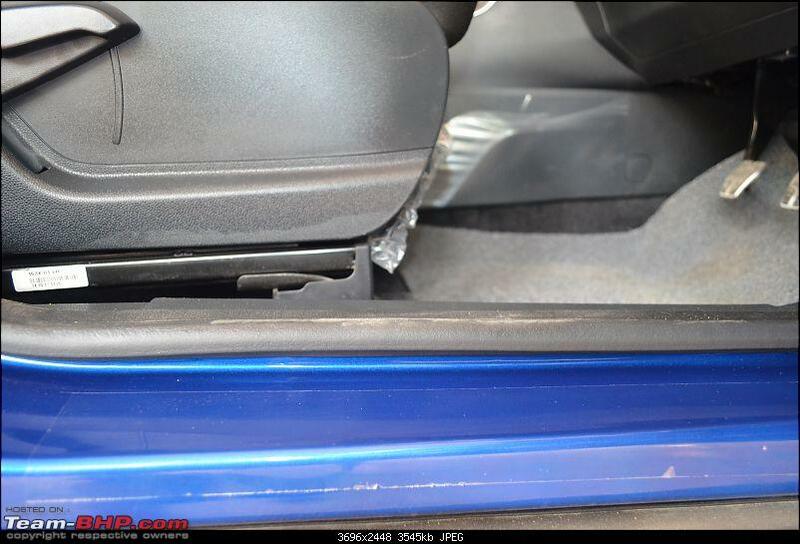 Notice the wide panel gap. The indicator is now placed in the fog lamp cluster. 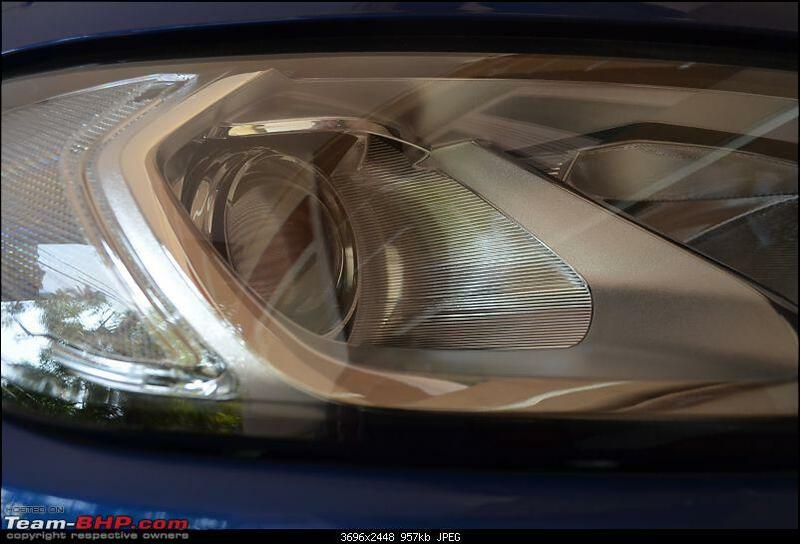 The fog lamp is well aligned to the headlamp cluster. 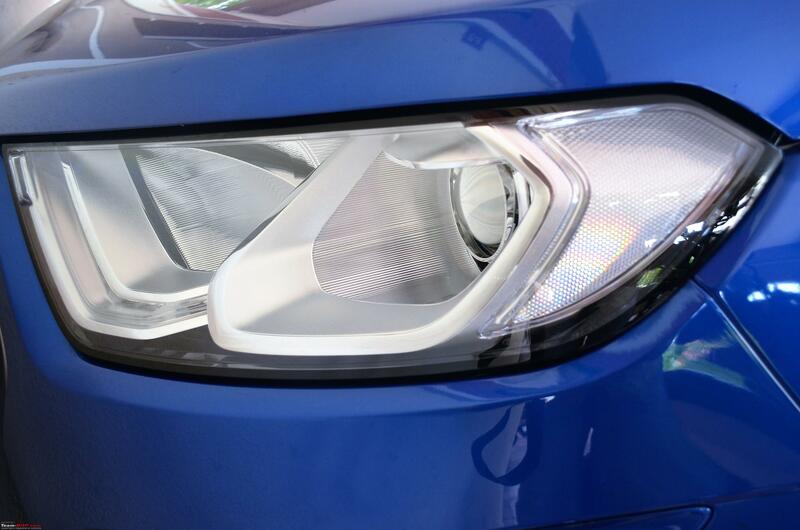 The cowl over the projector headlamp prevents light beams going too high. The side and back remain mostly unchanged with just the new alloy design. I personally prefer the older flower type alloy rims. However, the new ones are easy to maintain. Hard to guess the change. The roof rails get a satin aluminium finish in the Titanium and Titanium+ variants and a Black finish in the Trend+ variant. The Trend and Ambient versions don't get them. The rear bumper applique are standard with the Titanium and Titanium+ variants. 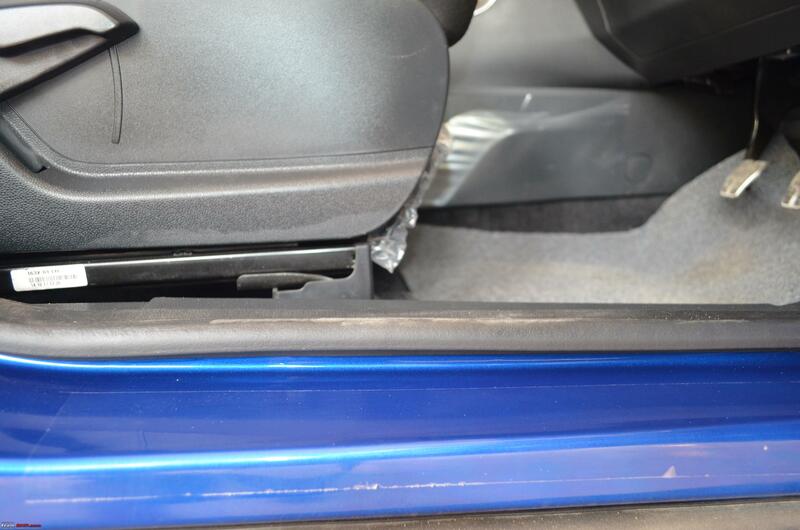 The only car with the rear mounted spare wheel in the segment for that SUVish DNA. 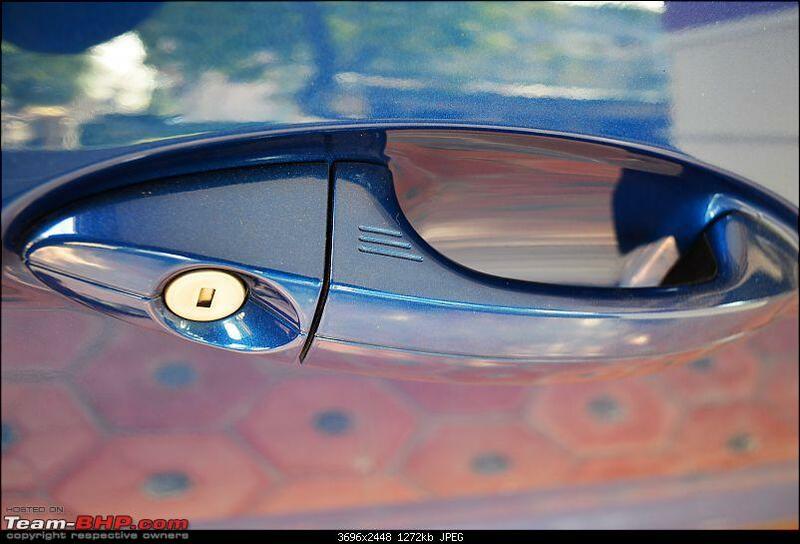 The spare has 3 wheel nuts of which one is a locking wheel nut which has a unique key for almost every car again a feature in only Titanium and Titanium+ variants. 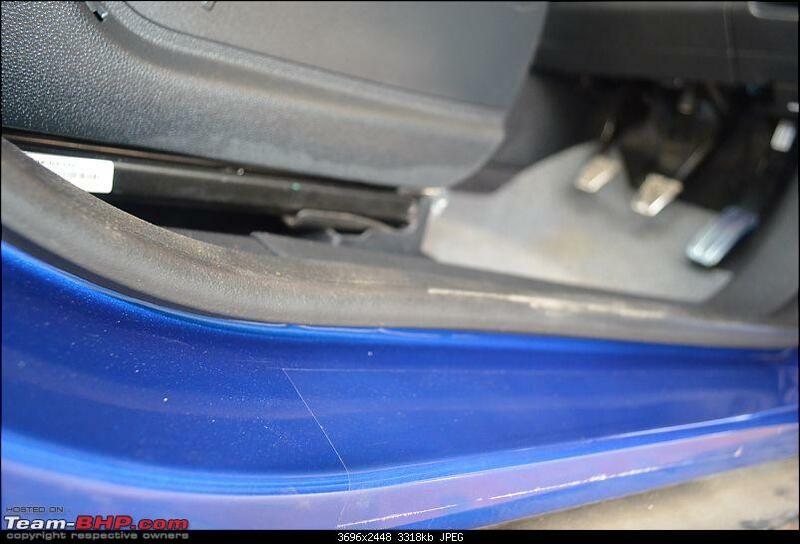 However, the Trend+ variant gets a spare wheel cover as standard fitment. 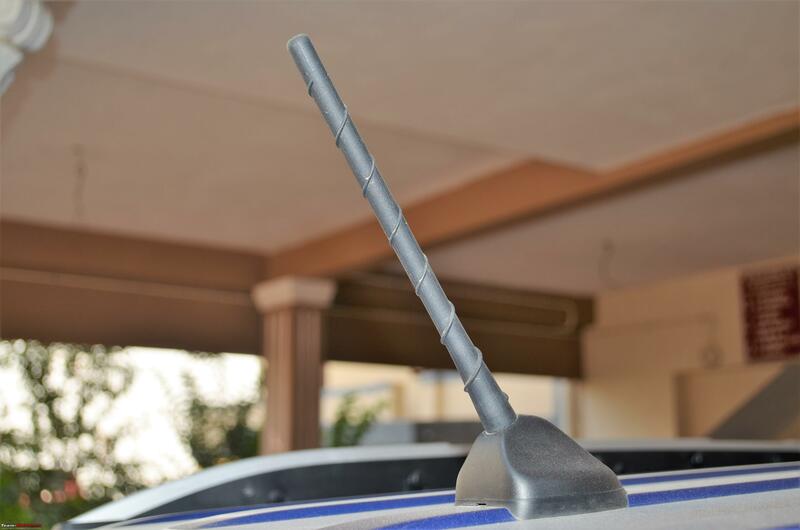 The long antenna that used to sit in the front has moved to the back and is now the stubby type. 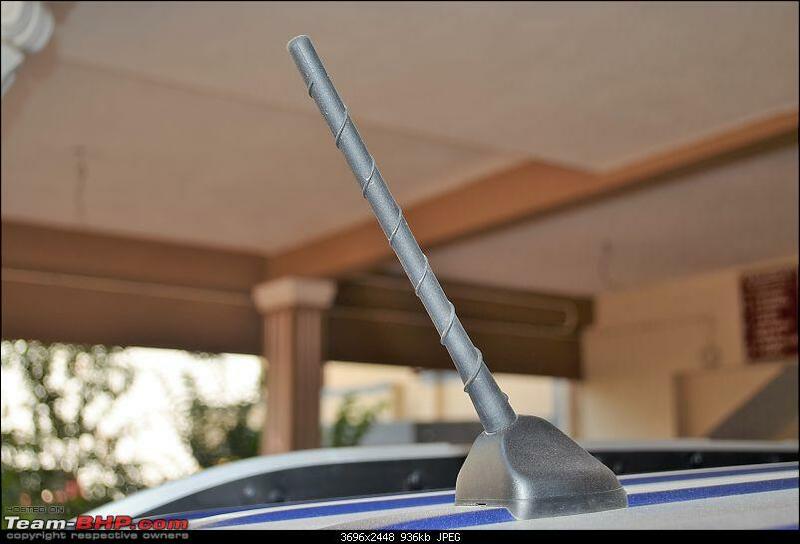 I would have loved the shark fin antenna more. The antenna is screw type and is removable. 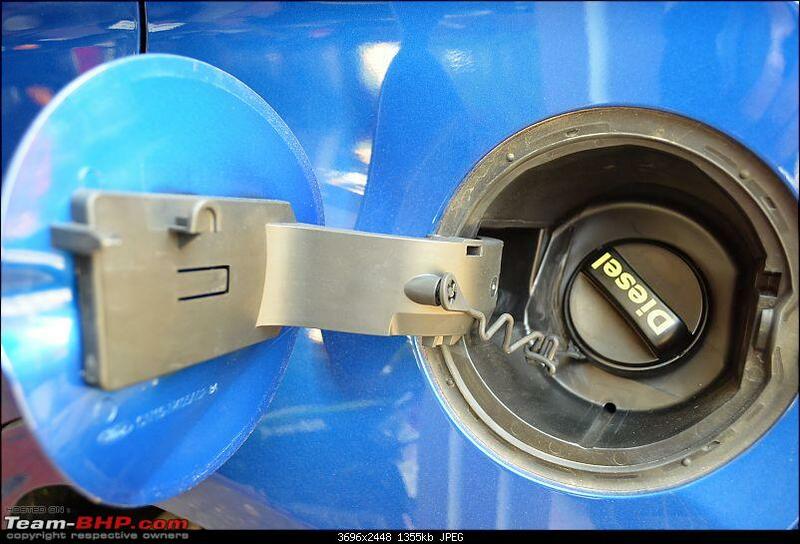 The Diesel marking is on the fuel cap on the inside. 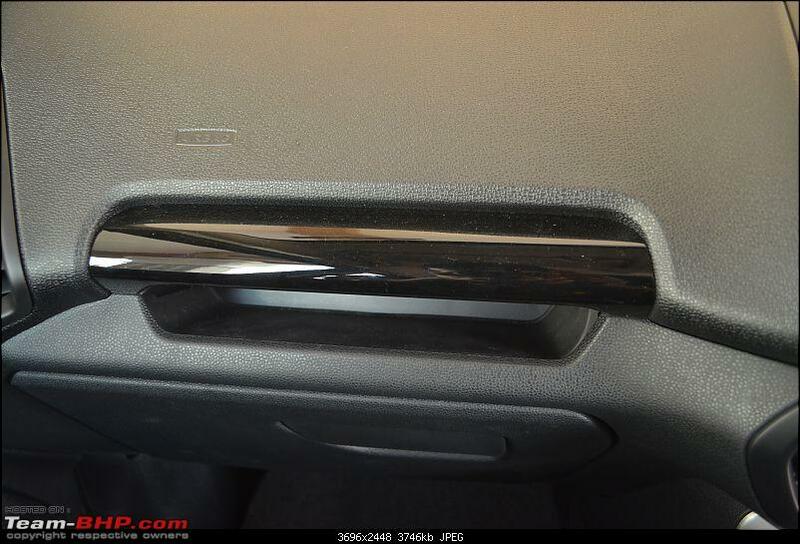 The ribbed part of the handle is the capacitive touch part for locking. 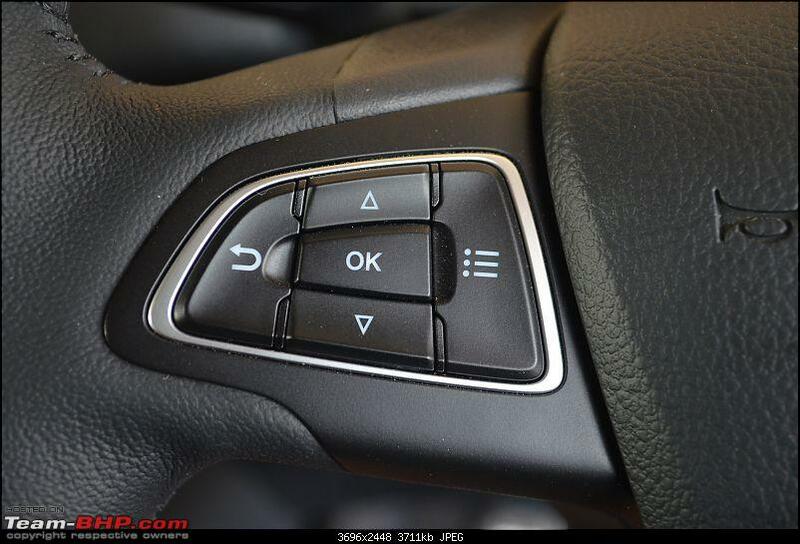 Just tap there and the car locks and the auto ORVMs close. Hold the door handle to open and the ORVMs open along. 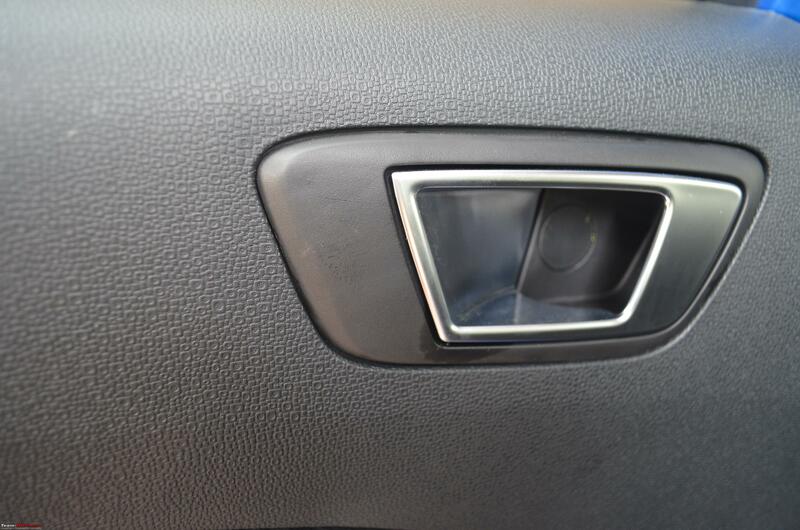 The push button to open the boot is now placed inside the handle. 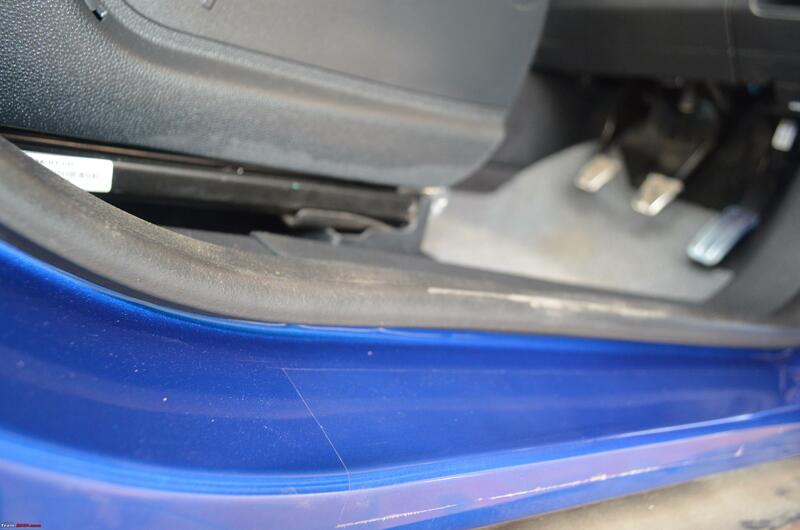 The jets for the washer liquid are now neatly hidden below bonnet. 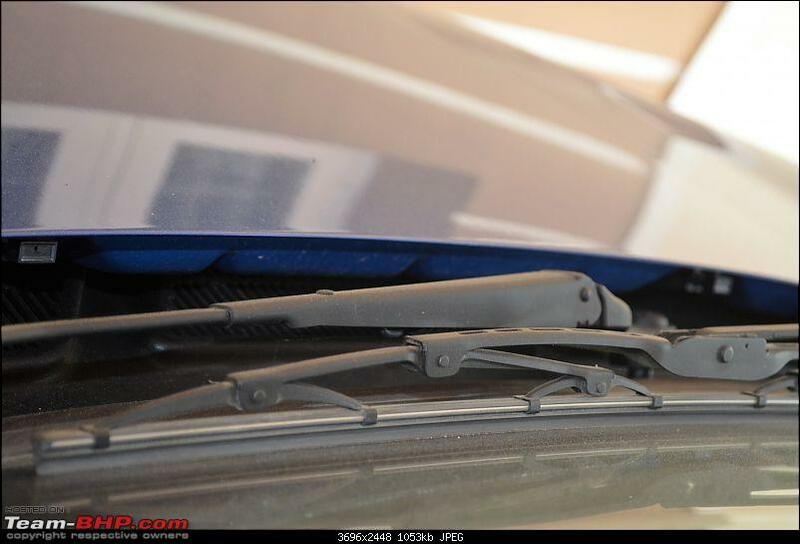 The rear wipers are now the frameless type. 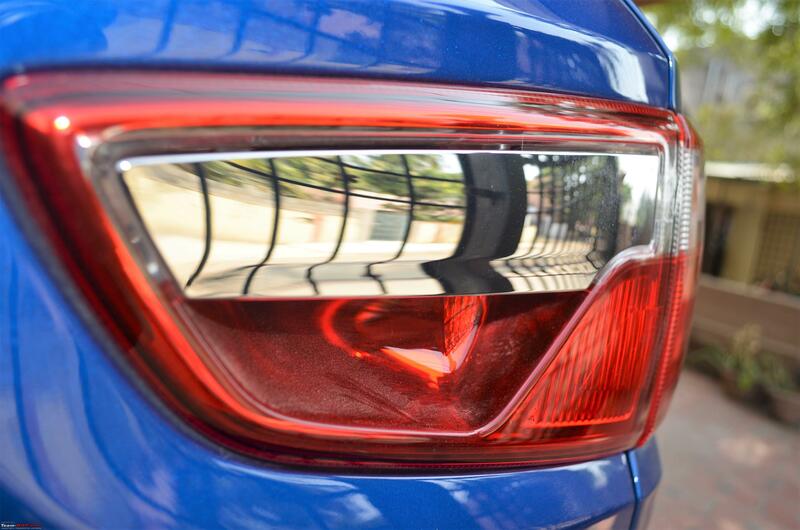 They enhance the looks from the rear. Last edited by Jude300 : 15th January 2018 at 10:24. 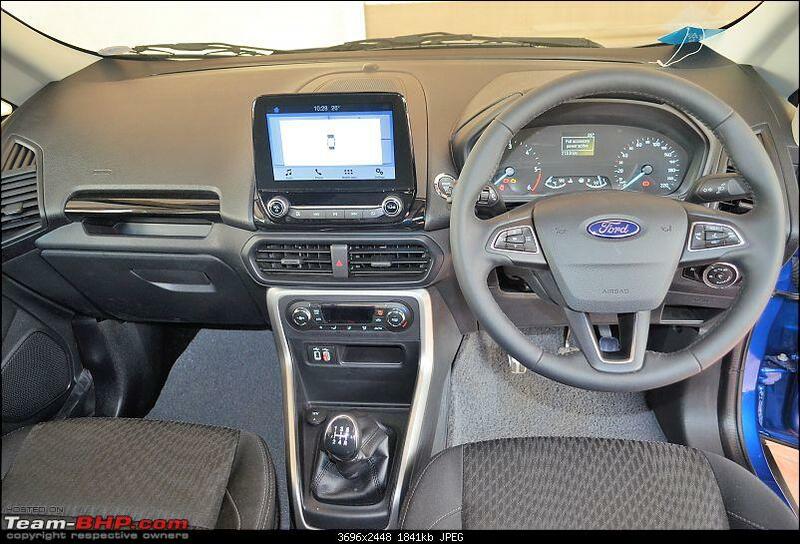 Most of the visible changes are inside the car beginning with the 8” touchscreen. Though the placement of most things remains the same, most of the parts have undergone a change. 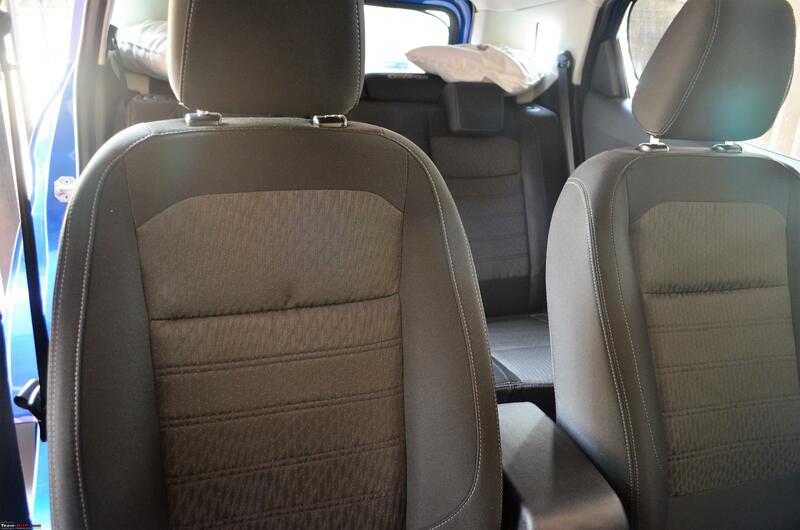 The interiors is also the place where you would make out that its not just a usual facelift. As always, the quality of the switches remains uncompromised and is ergonomically placed. The quality of the plastics is good but might not be the best. 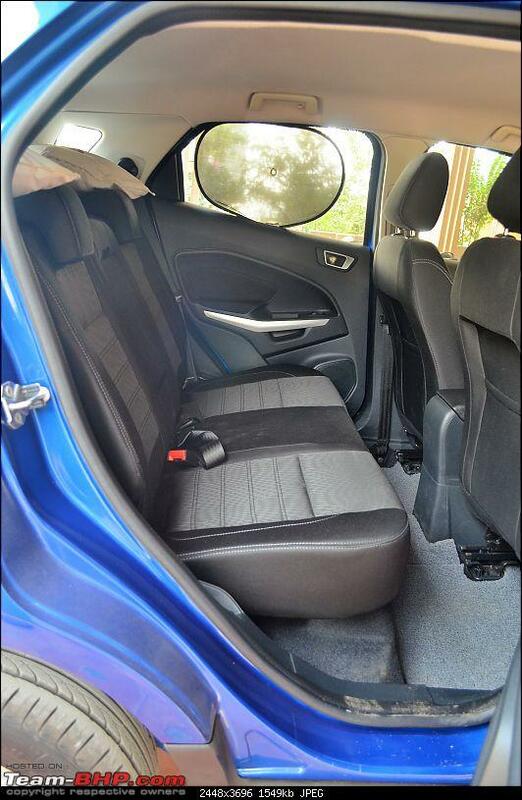 Space inside also remains unchanged and the rear seats can accommodate the 3rd person with a bit of squeeze. Many say that the 8” touch screen is on your face. But I feel it’s ergonomic and while on the drive does not interfere with the view. 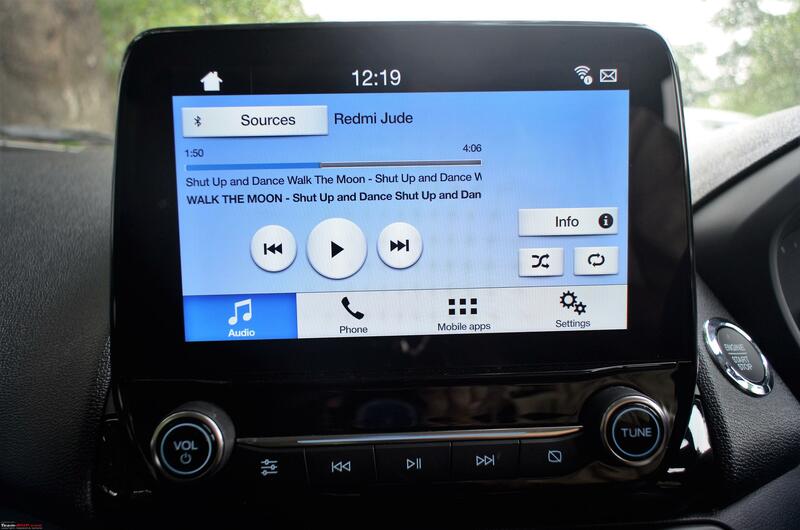 The touch is smooth and the icons are large and easy to access. The display is clear and is not impacted by sunlight like we see in many cars. Also, the screen turns to night mode the moment the park lights are switched on. While SYNC3 works flawlessly and understands the commands I still am not a fan of voice commands. What I found very useful though is the SMS read feature. I shall be doing a detailed video later and post it here. 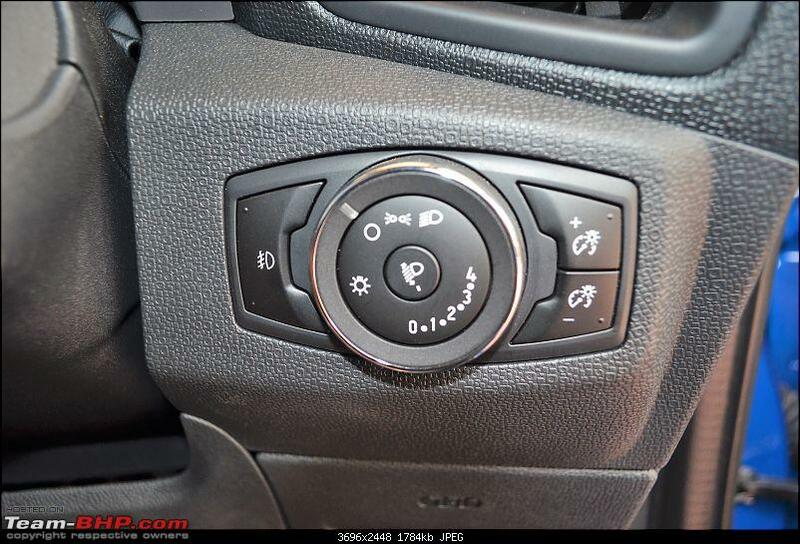 Though the Titanium variant does not get a reverse camera, it does get the reverse sensors and a reverse proximity indicator when the reverse gear is engaged on the touch screen as seen in the picture below. There is also an audible beep warning. 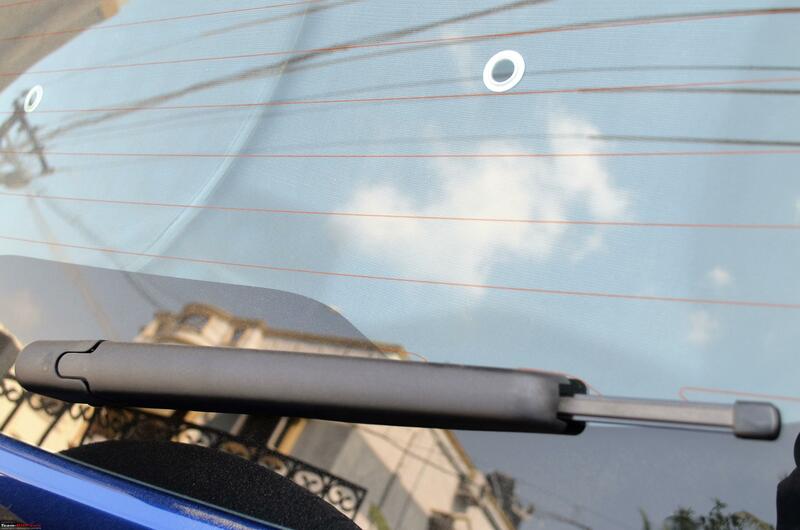 The onscreen keyboard to search places cannot be used while driving and can be used while parked. Safety first; a good move. The touch screen is a fingerprint magnet. The fonts are large and legible to read. The screen is not impacted by sun glare. Also, when the park lights / headlights are turned on the screen goes to night mode where the blue background turns black. The buttons below the screen are soft touch and are well spaced out. The volume and tuning keys have a rubberised grip and are nice to hold. The button just before the tuning key is to turn off the screen. The controls for the air conditioning are a lift and drop from the Figo twins. They are functional but placed a little low. You might want take your eyes off the road to adjust them. 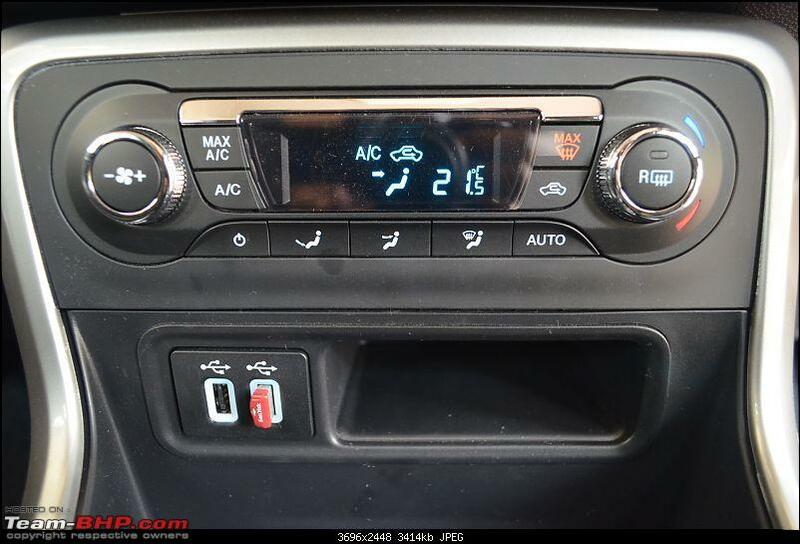 The AC chills the cabin quickly as expected of any Ford car. 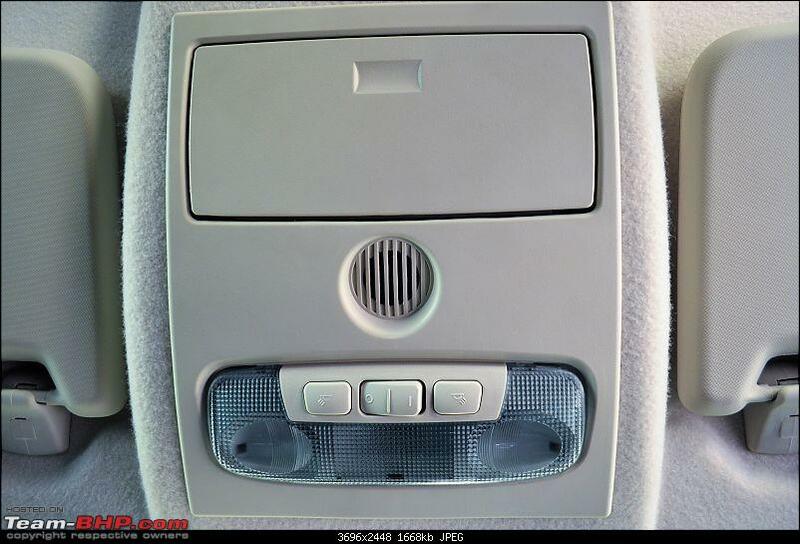 The central vents are place a little lower but doesn’t impact the circulation in anyway. 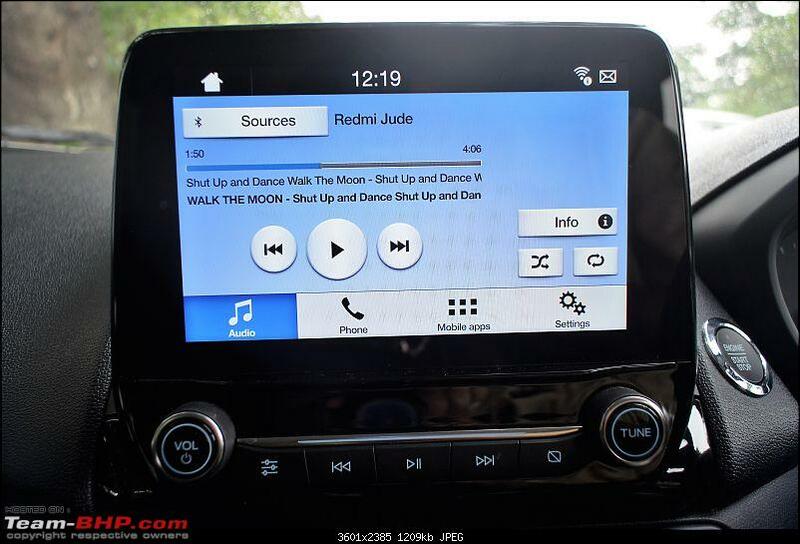 The 2 USB ports can charge your mobile and can be used for Android Auto / Apple Car play. Beside the ports is a small place to keep parking tickets / wallets. 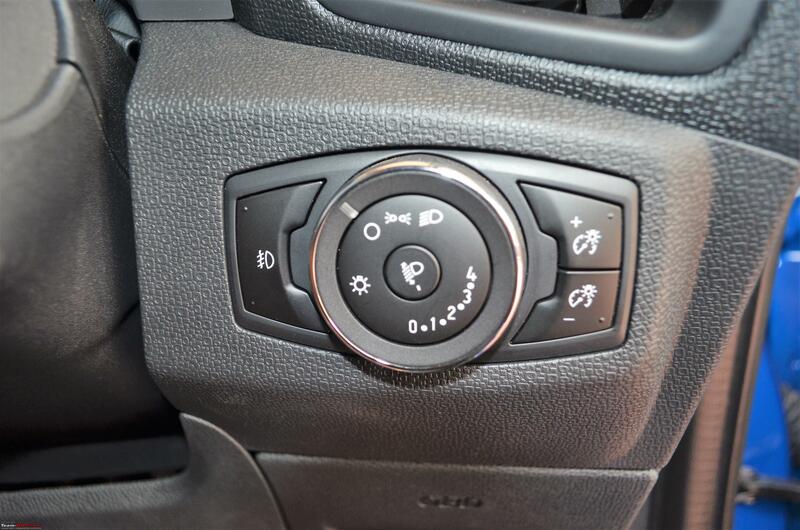 This is where the Traction control button is placed in the Titanium+ variant. 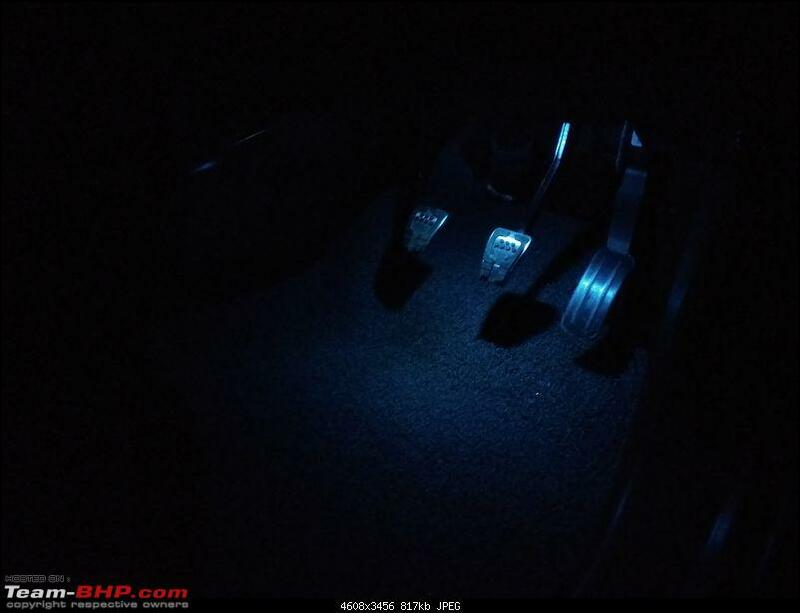 The rotary switch for the headlights have also changed and now it houses the Fog Lamps, headlight leveler and the switches to adjust the brightness of the instrument cluster. Press the small circle in the center to pull out the leveler switch, a nice touch. 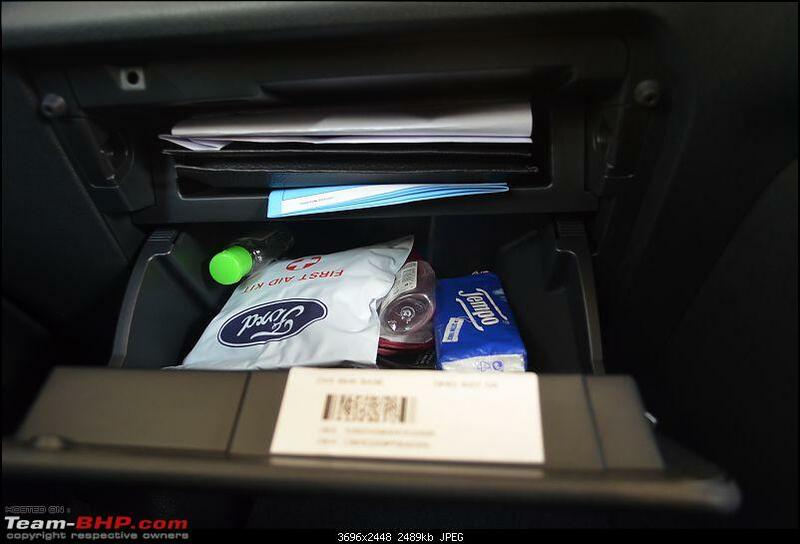 Just below the headlight switches is a nice cubby hole for keeping parking tickets / toll receipts. 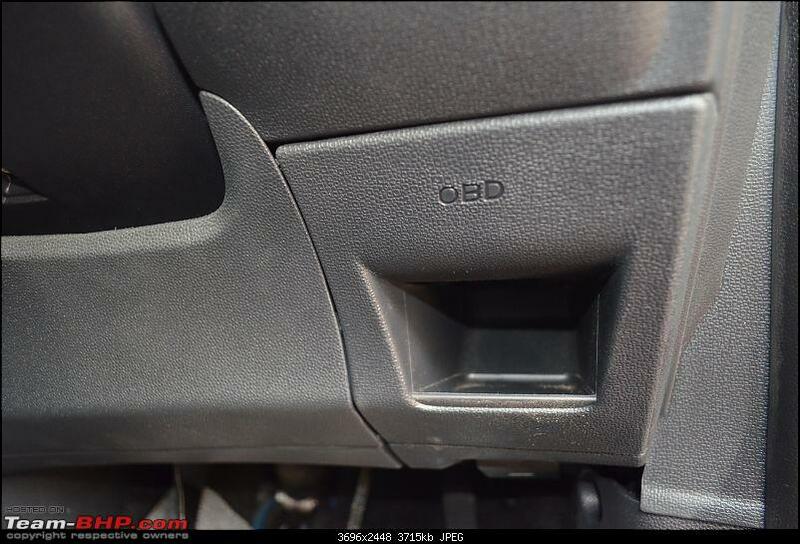 Notice the "OBD" marking. 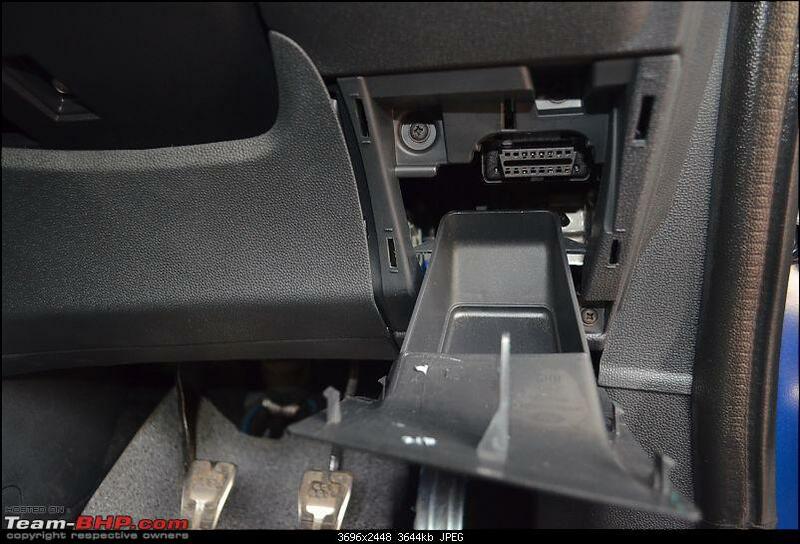 Pull it out to access the OBD port. 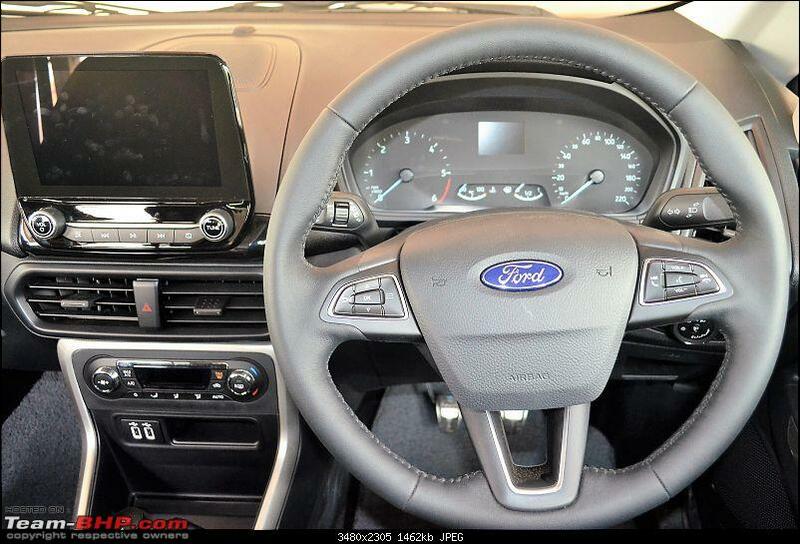 The Steering wheel is of the enthusiast’s taste, is nice to hold and properly sized. It has the thumb contours and the leather wrap is a bit rough giving enough grip. 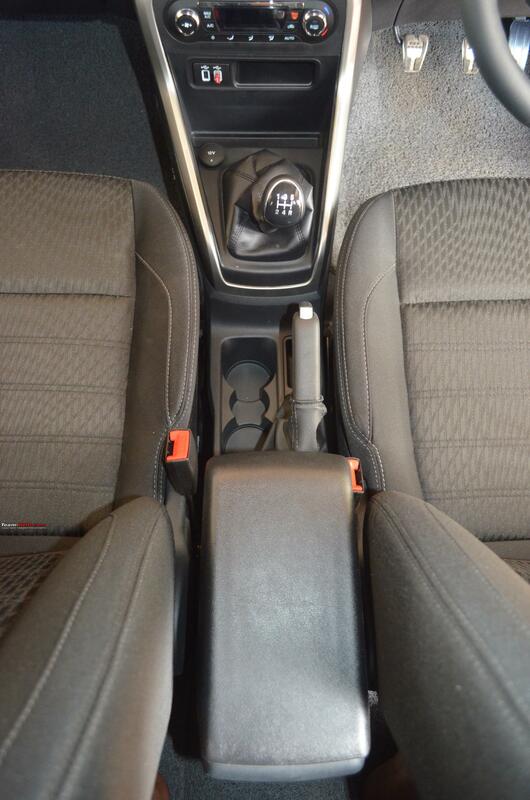 The steering is tilt and telescopic and helps the driver settle into the most comfortable position for long drives. The horn pad in the center is a stretch to reach with the fingers but is a bit softer to use than the outgoing model. 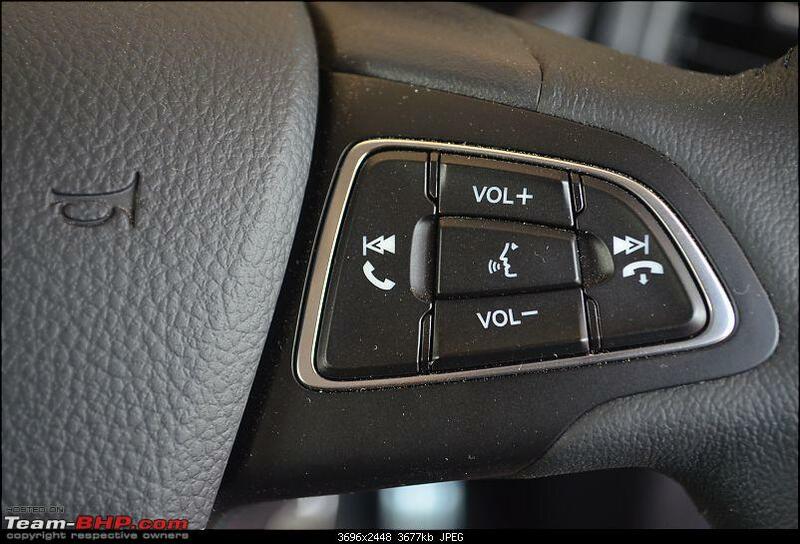 This was a point widely provided as a feedback to Ford in the outgoing variant. 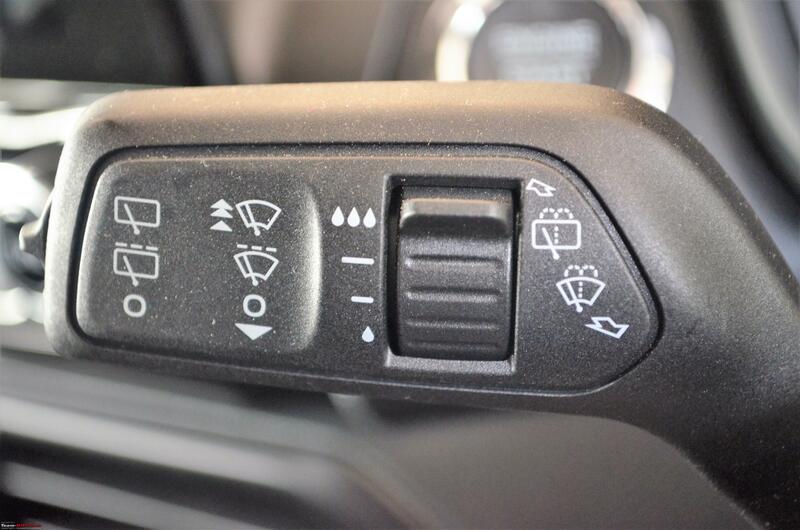 The buttons to the left of the steering wheel are for using the MID fucntions. 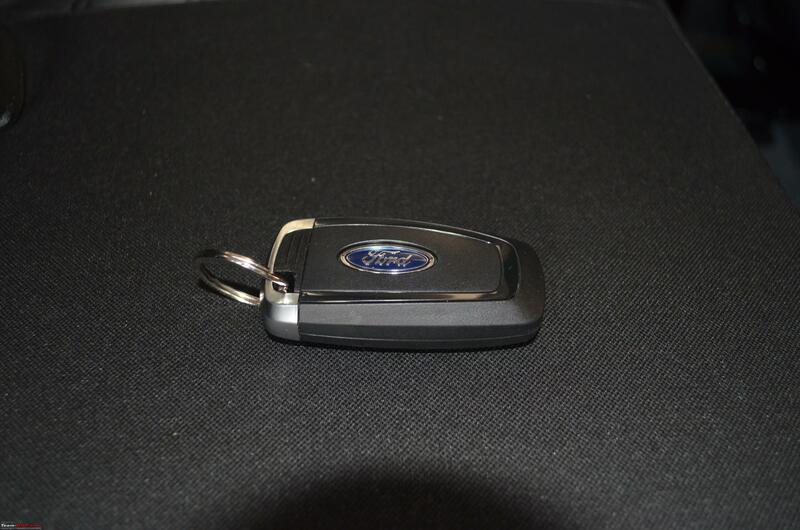 These can also be used to setup the Ford “My Key’ functions. On the right side are the keys for controlling the infotainment system including the SYNC voice control button in the center. The buttons are well placed and are of good quality. 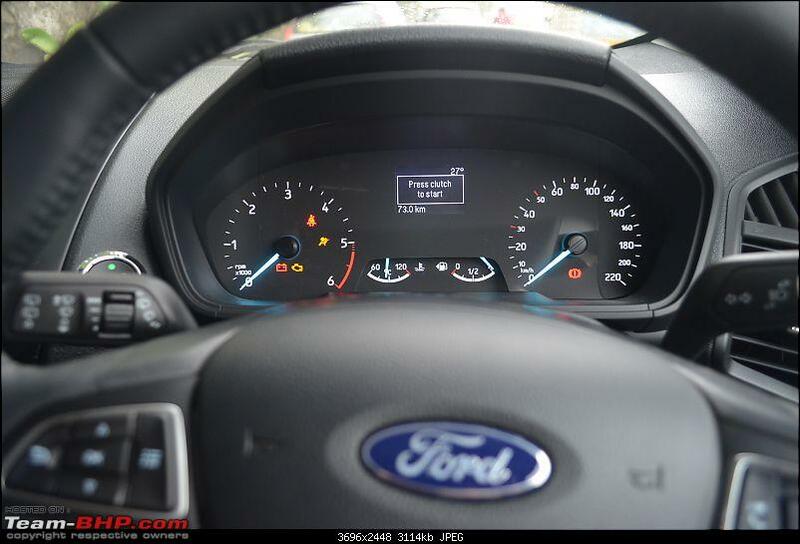 The bland and purely functional instrument cluster. The only place of glaring cost cutting. Its a shame and not expected of a company that comes out with driver friendly cars. The engine temperature gauge is a good addition. The wiper and indicator stalks are now placed the Indian way; wiper at the left and the turn indicator stalks at the right. 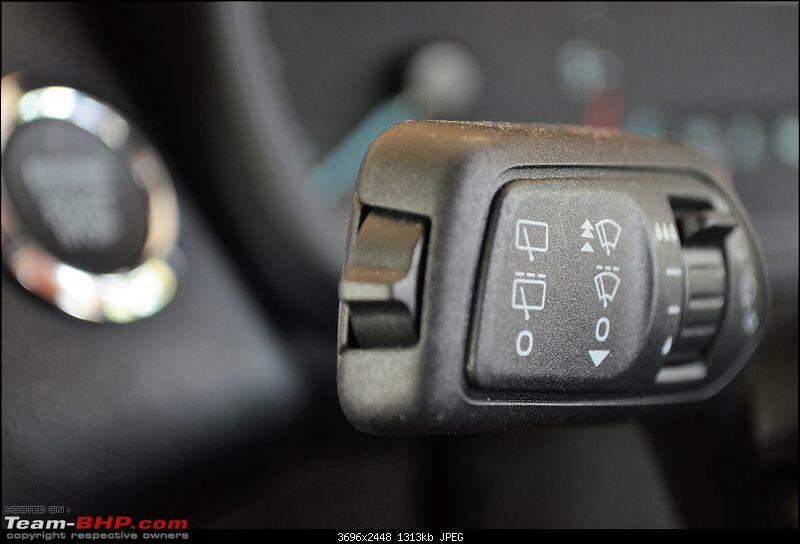 The intermittent wiper setting has been changed to a small lever type switch from the earlier rotary type. I found the rotary one to be a wee bit easy to use. 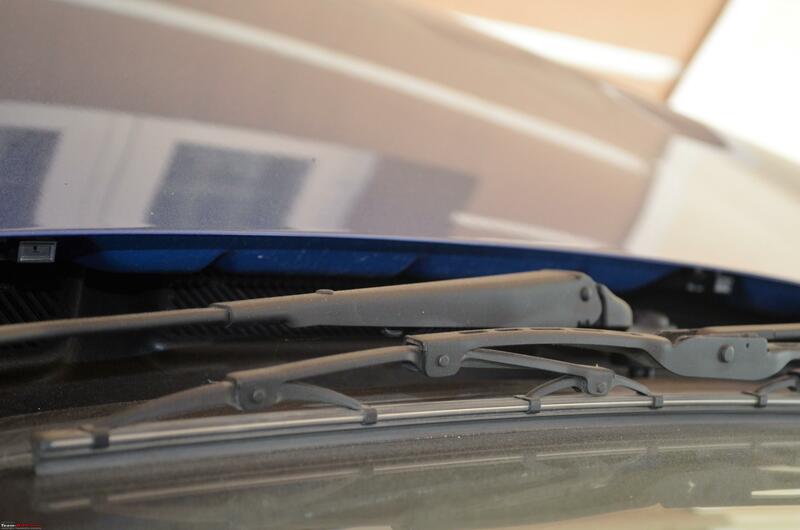 The rear wiper can be turned on using the small lever type switch at the edge of the wiper stalk. 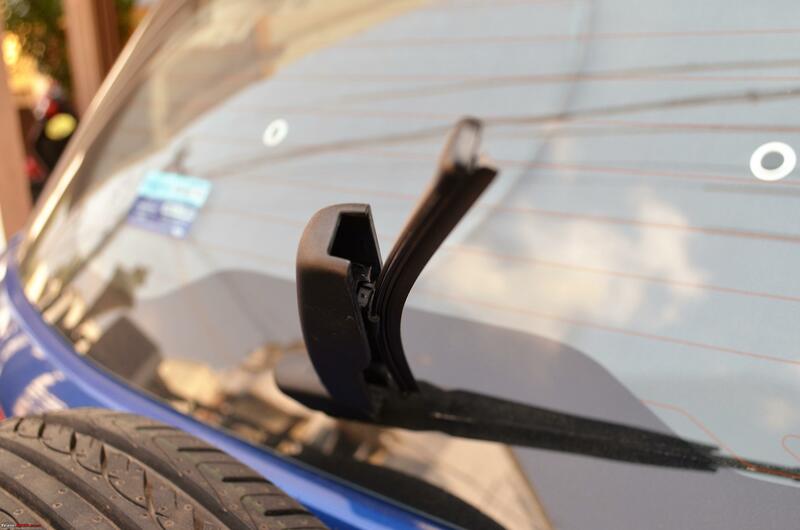 You might by mistake turn it on while using the wiper stalk. Last edited by Jude300 : 15th January 2018 at 11:26. The Sunglass holder is a nifty feature. Though it has a soft spongy inner lining, in rough road conditions I can hear my sunglasses rubbing the plastic with a feeble ‘grrr’ sound; may be because of the bigger sunglass of mine. The mic for the voice commands and phone calls in the center followed by the lights. There are 3 lights, 2 reading lamps on each side and a light in the middle. Thanks Ford for not saving on cost there. 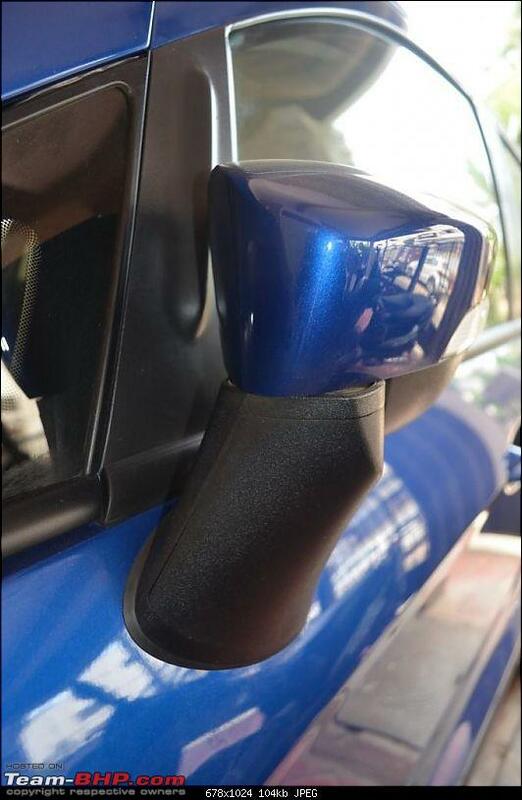 While the passenger gets a vanity mirror with an independent lamp but the driver doesn’t to avoid beauty conscious drivers from any distractions. The mirror gets a cover too. 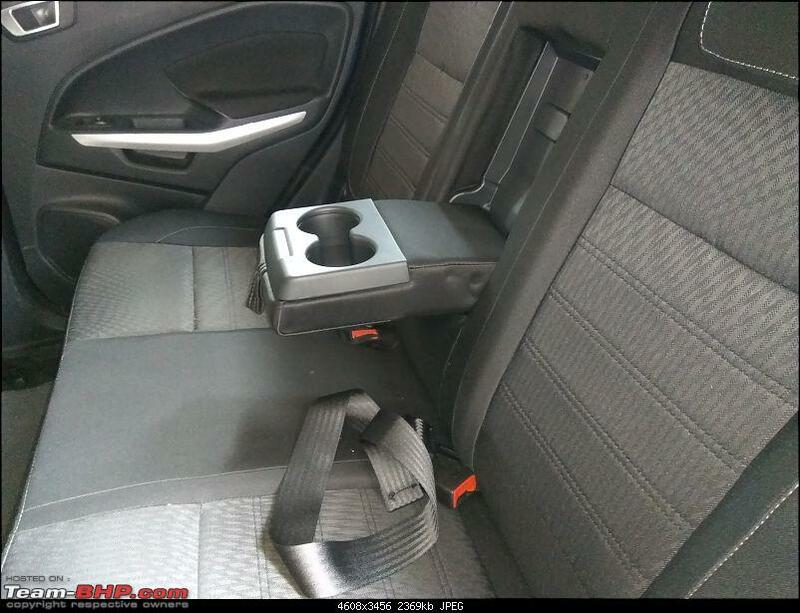 The armrest in the front would have been a good addition only if it was a sliding one. For an average Indian it is not of great help and is sort of useless. 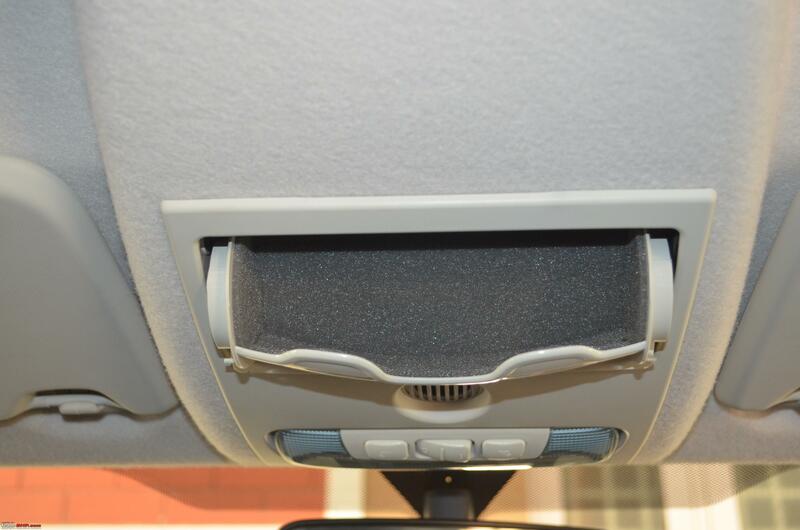 Not sure why manufacturers do this; providing a feature which is useless. 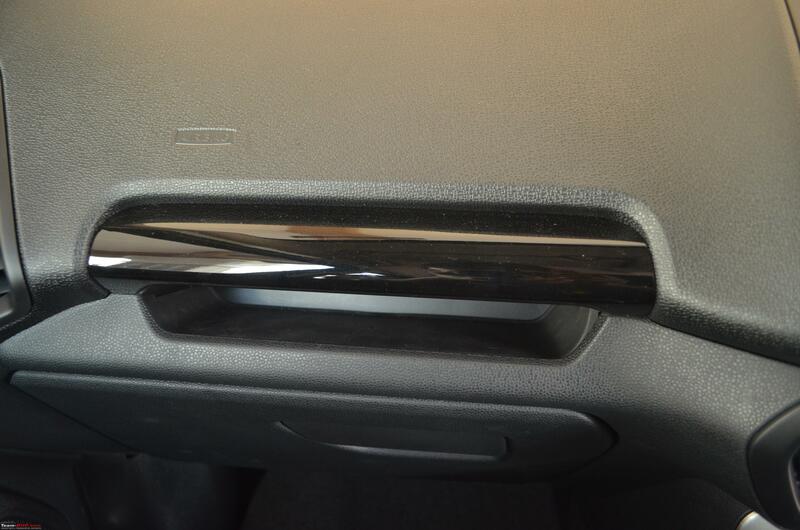 The storage inside the armrest is deep and narrow. I use it for storing my charger and essentials kit like candle, torch, matchbox, spare tooth brush and comb. Just below the armrest there is a place to keep pens too. The bottle holders can hold only half litre bottles. 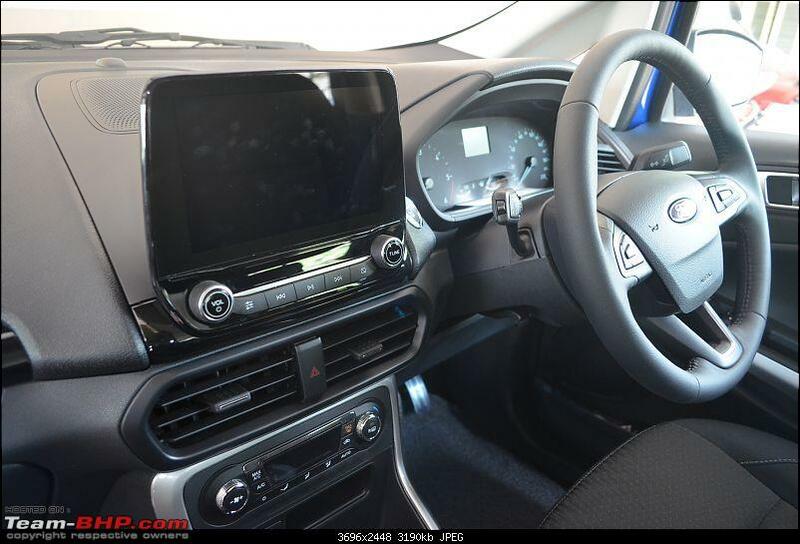 The storage provision on the passenger side is actually very useful especially to place the mobile phone when it is connected to the infotainment for using Android Auto / Apple Play. The best part is that it has a soft rubbery surface that protects your phone from being scratched. 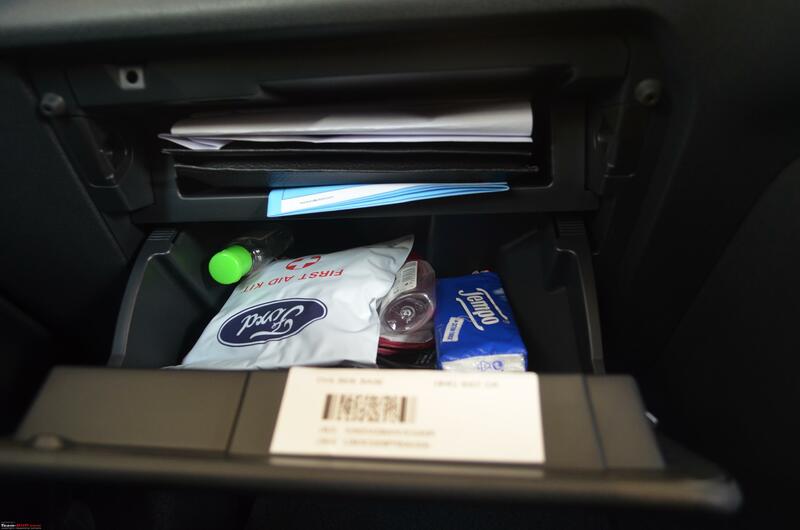 The glovebox is still the same with very little storage space. The seats have been reworked to make the seating more comfortable. 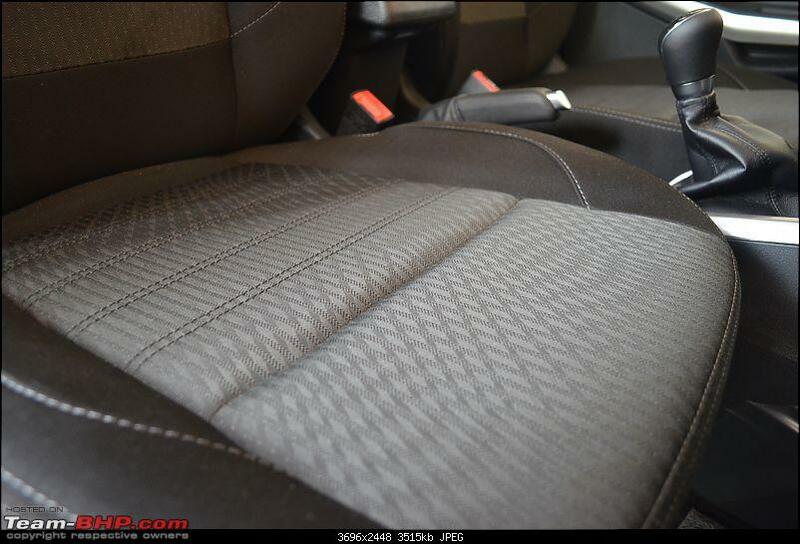 The fabric seat cover is awesome and does not require additional seat cover if you can maintain them well. The contoured front seats at the back release more knee room. 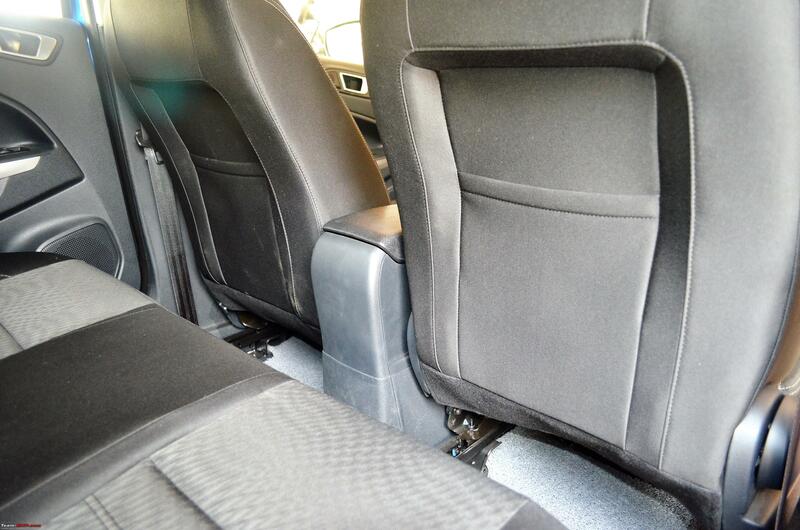 Both front seats get seat pockets at the back. 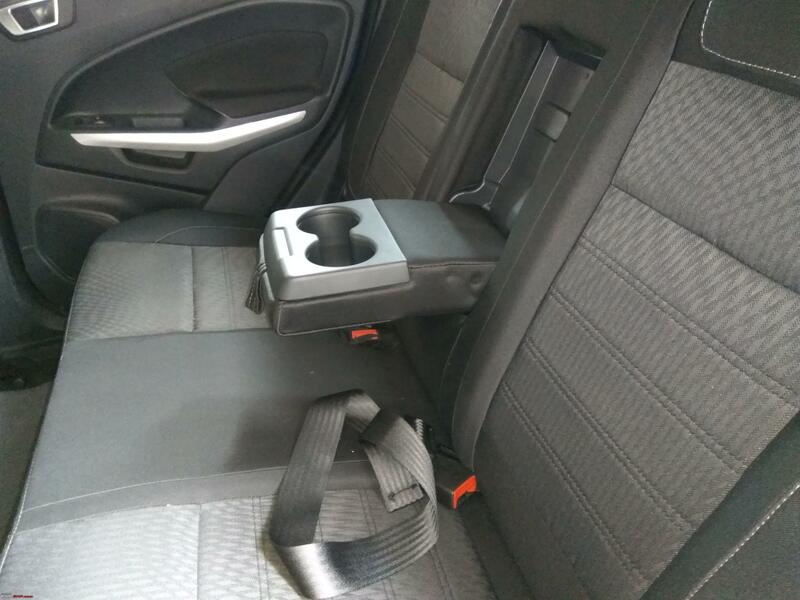 The rear armrest is useful and well placed. 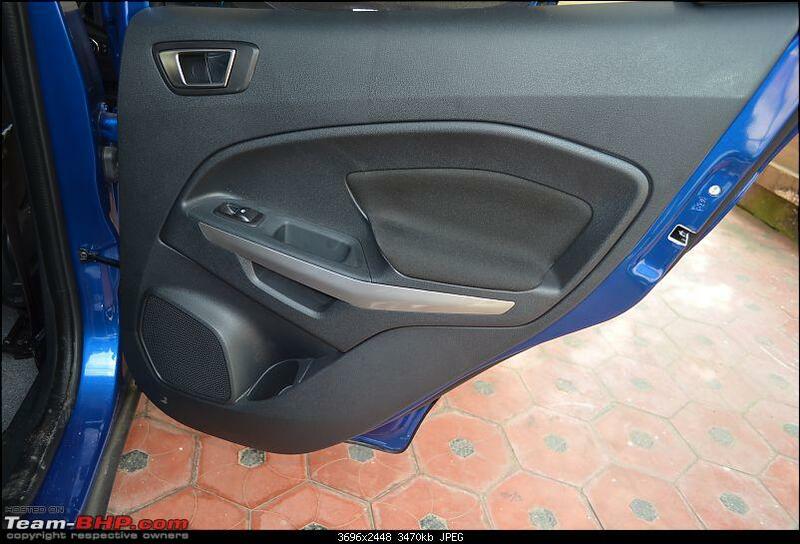 The doors have not changed much except for the locking buttons and the positioning of the adjustment buttons for the ORVM on the driver side door. 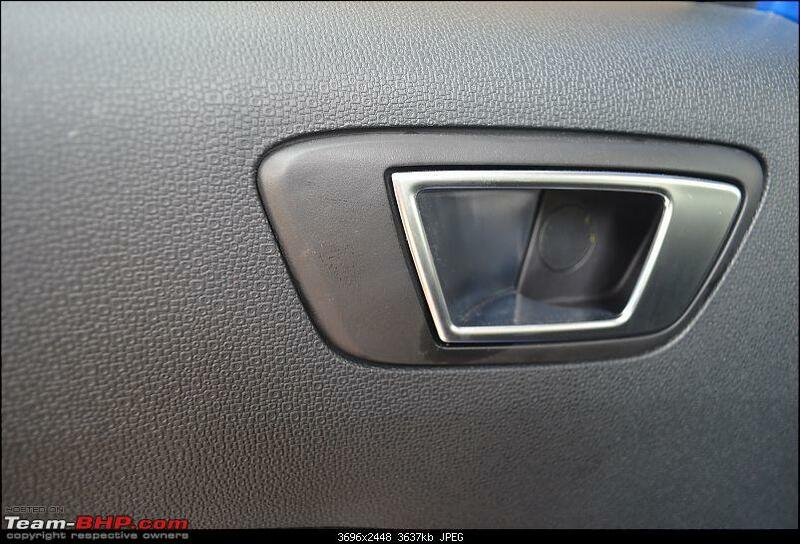 The auto lock feature that locks the doors as we cross 20kmph is not available now and we need to lock the doors manually. Not sure why Ford did this. I am not happy with it. 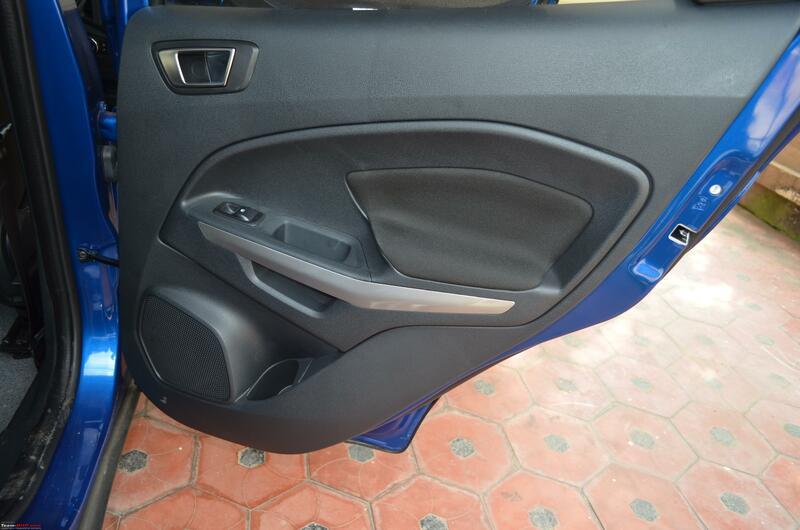 The doors get soft fabric lining to place your hands and relax. There is a tweeter inside unlike the outgoing variant where it was just a dummy. The brushed aluminium inserts are a neat touch. 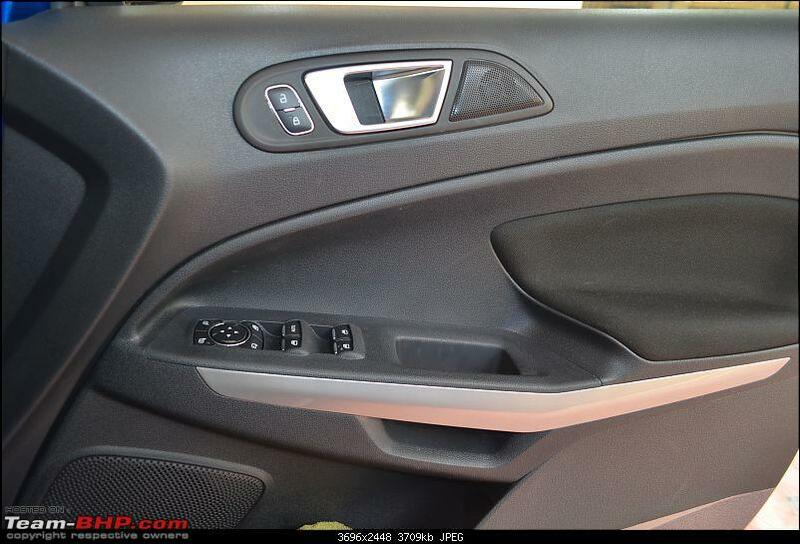 A closer look at the inside door handles. They are firm and durable. The ambient lighting at night. You can turn it off if you don’t need it. 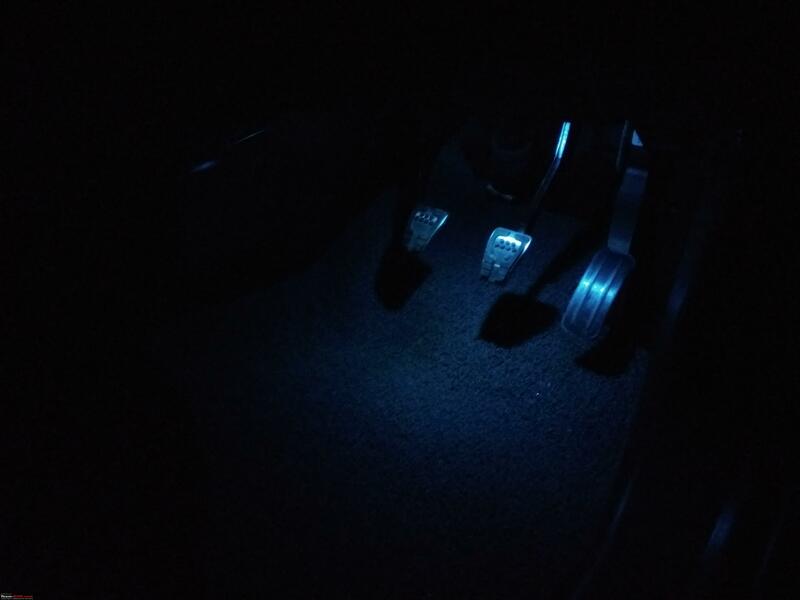 The sporty alloy pedals illuminated by the ambient light. Last edited by Jude300 : 15th January 2018 at 11:32. 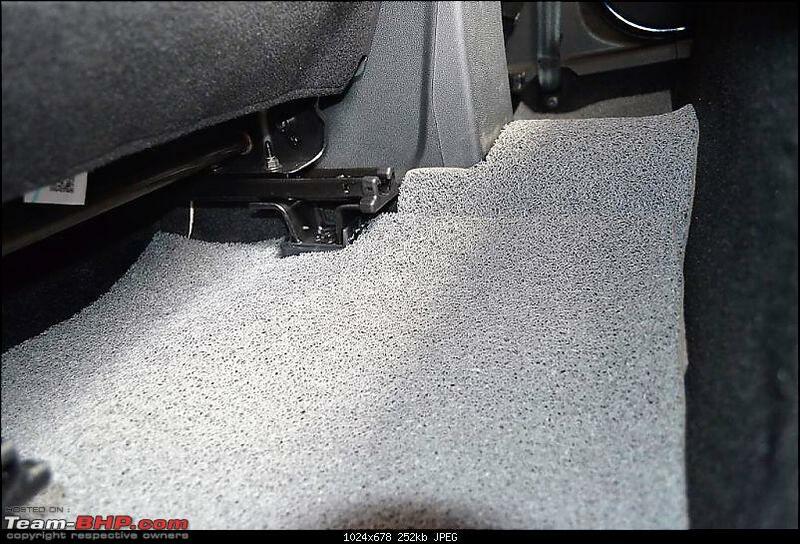 As in my old car, I opted to use the noodle type floor mats. Costed Rs. 70/- per square feet and bought a 4feet by 4 feet (16sqft) piece. The detailed process can be found in my DIY post and Video. The mats have come out well again. To protect the door stills from scratch, I put on the paint protection film myself. I am working on a DIY video on how to do that and will post it later. Since I used the film that was 4 years old I had a tough time sticking it. Notice the edges of the film has not stuck properly due to its age. I would change it sometime in the near future with a new film. A view of the rear door. 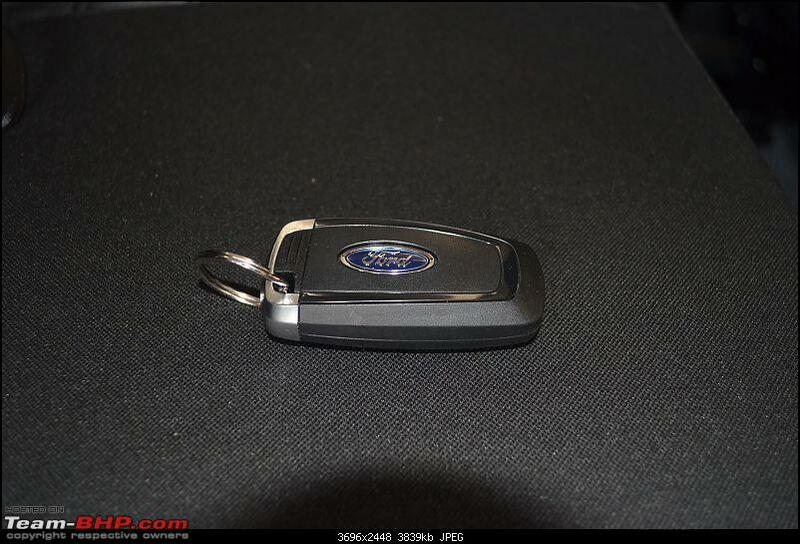 And finally the keys, both are smart fob keys, a welcome move by Ford. The basic Lock and Unlock buttons. 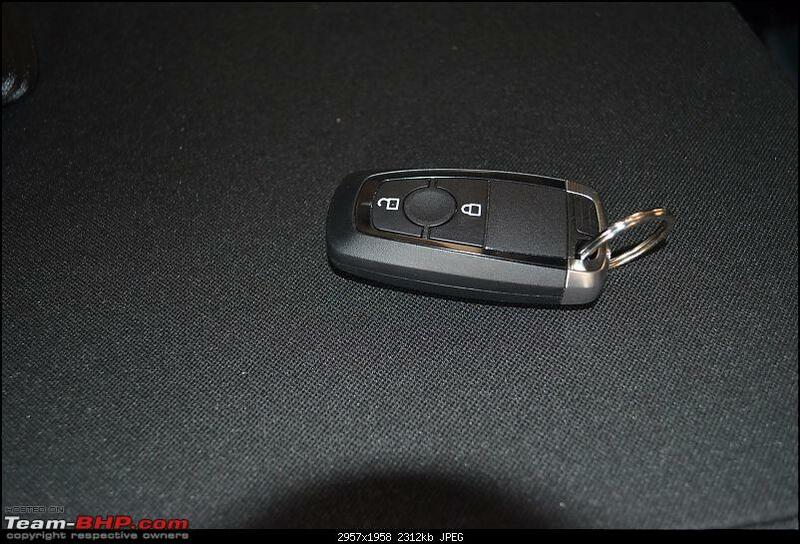 By pressing on the ribbed portion we can pull out the key incase the battery is down. 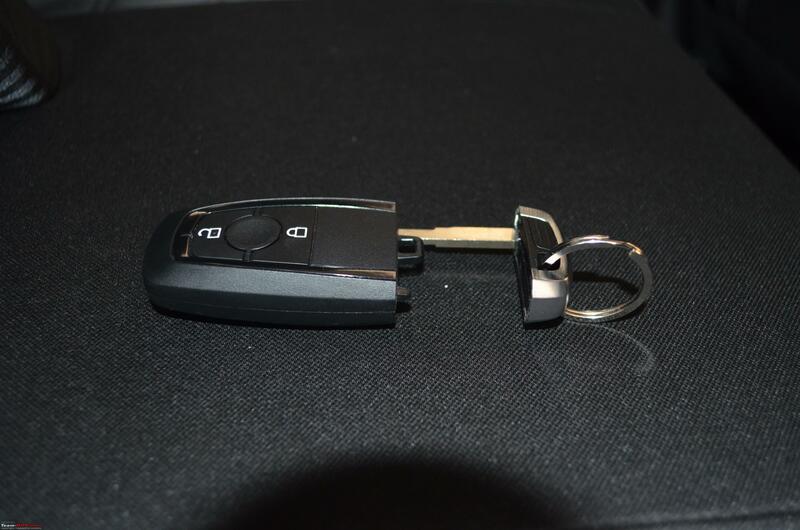 However, the key can be used only to open the car. 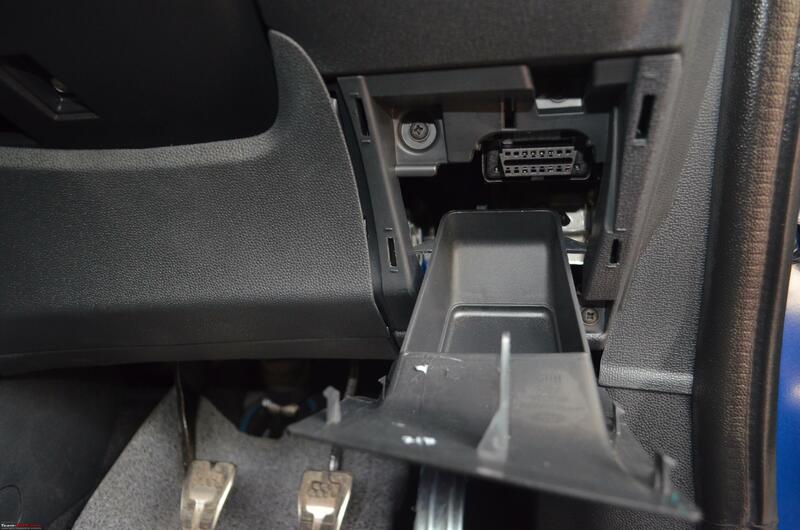 To start the car when the battery is down, we will have to place it in a slot inside the front armrest. Last edited by Jude300 : 16th January 2018 at 08:54. The 1498cc, 4-cylinder motor churns a 100 PS @ 3750 rpm and is now a familiar one in the Ford family being the only diesel engine on offer on any Ford car in India. Having a good history this is a very reliable engine which is well refined as well. The engine has enough grunt with 205 nm of torque which is on tap as low as 1750 rpm and peaks out at 3250 rpm. With a weight of 1300 kg the power-to-weight ratio stands at a decent 77 BHP / Ton. 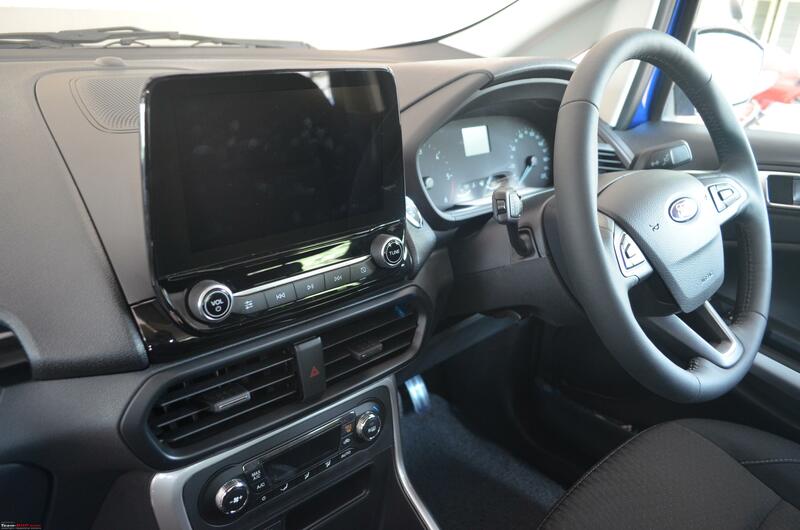 With the torque on offer at lower rpms and the light steering wheel, City drive is a breeze as it has been always. With very little turbo lag, you can zip through traffic. 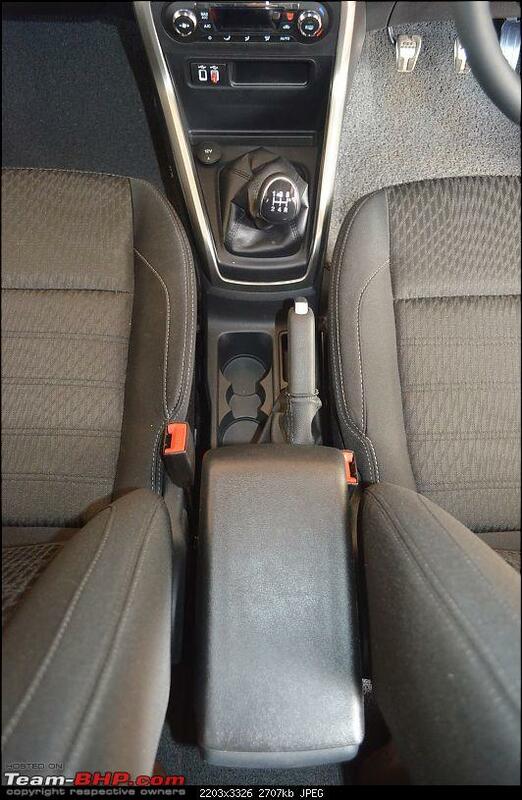 It has enough steam even in the second gear to run over bumps without shifting down to the first gear. 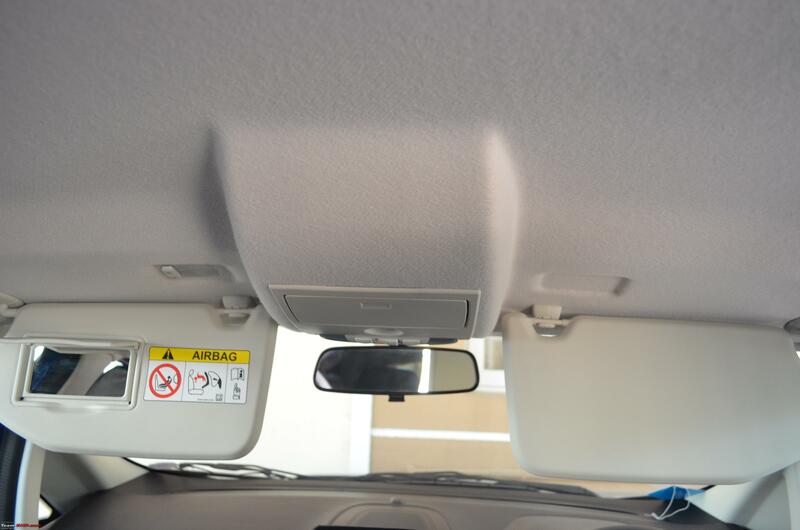 The light steering also helps fit into to tight spaces for parking as well. The acceleration and power delivery is linear which means that you will not get the feel of being pushed back to the seat often. For the drivers who want the adrenaline rush this might not be the car to be on. 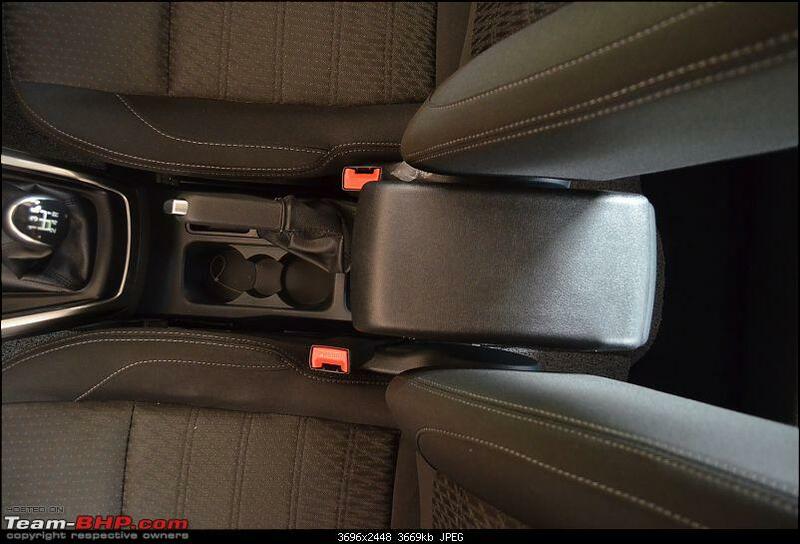 The gearbox has been improved over the outgoing model and feels lot more slick but not the best. The clutch is heavier than the one on the Nexon but not that heavy to be a deal breaker. However, the refinement of the engine is evident as soon as you wake it and start riding. 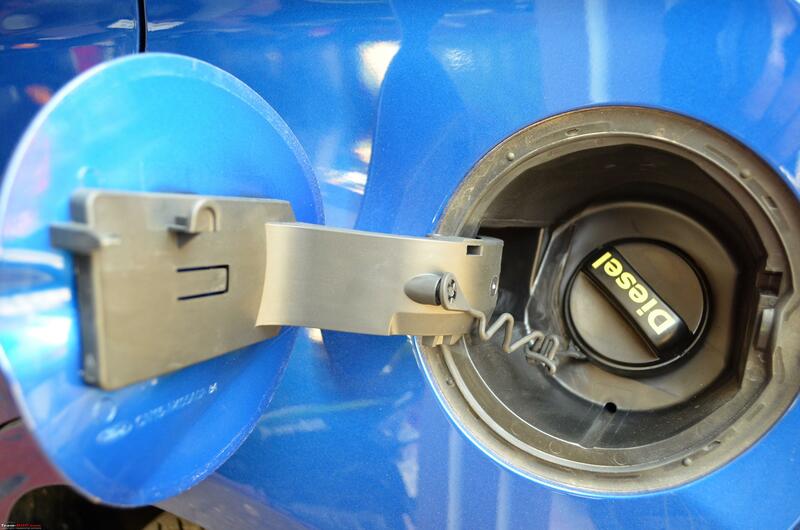 On the highway, the diesel is eager to be on the boil and is quite rev happy. You can easily do 120 kmph all day long without a fuss. Haven't gone beyond 90 kmph on my new car yet as I quite strictly follow run-in rules. Infact, I do a proper run-in for the first 3000 kms atleast. However, based on my experience with my old car which was tuned for 90BHP, I am confident that the new one which is tuned for 100BHP will behave in a similar fashion. It has enough power on tap until very high speeds and looses steam beyond that. Overtaking at less than 120 kmph would be effortless for the engine as it would still keep pulling well. Driving on the ghats in the diesel is something I love doing. That is when you really feel the grunt of this brilliant engine. I love going to the hills and this machine has amused me a lot on those lovely drives. It just pulls off well on steep inclines and you really feel the power flowing to the wheels. On normal inclined stretches on the ghats with a full house, the 3rd gear will do the job well. 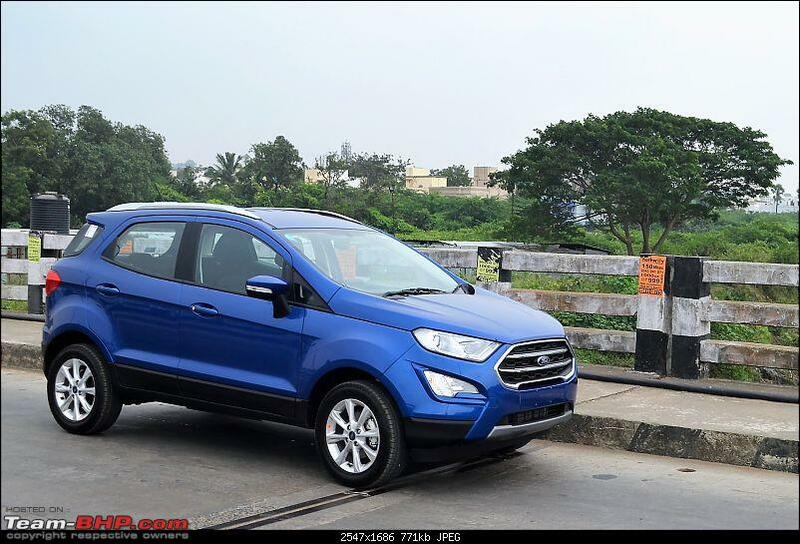 It's this diesel motor that made me by my second Ecosport. This is one jewel of an engine. While I had the S-Cross as my fall back option, after owning the Ecosport for 4 years, the engine on the S-Cross was a real deal breaker for me. The Nexon has a new diesel horse but again I wasn't that excited when I took the test drive though for a Tata it is a good engine. The steering is light and weighs up decently on the fly. Being an EPS you might not get much of a feedback that you would from a hydraulic steering unit and is not of an enthusiast's taste. However, with most modern cars coming with EPS to aid efficiency, this one is one of the best in the lot. One of the best things about the steering is that when you take a full turn and just leave the steering it actively returns to the straight position. This means you don't really need to work on the bringing back the steering to position which can be a big boon in city rides. The cold engine has the diesel clatter and it settles down to a much more muted tone as it warms up. 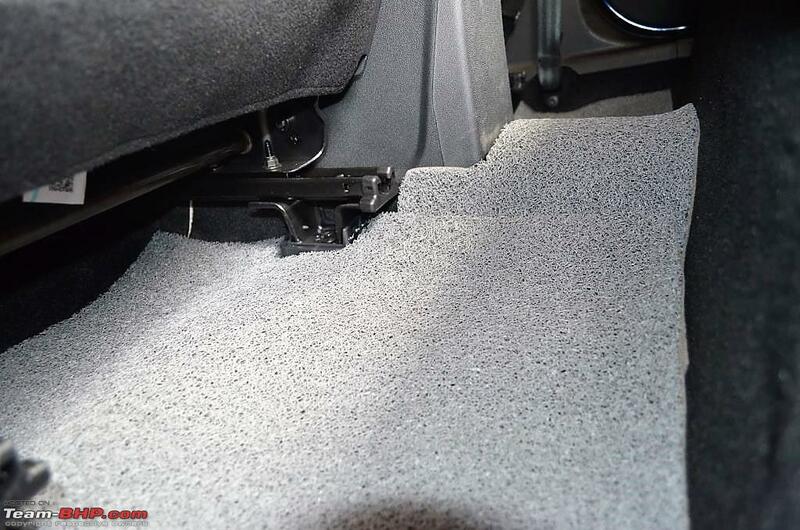 However, this is only felt on the outside and the exceptional sound insulation hardly lets you know that there is a diesel motor under the hood. 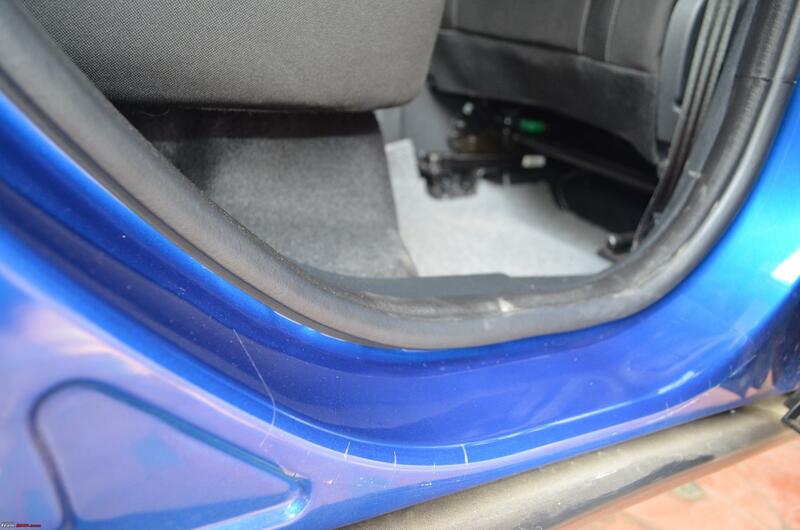 The NVH levels have noticeably improved over the outgoing variant and there are no irritating vibrations felt too. On the highway we here a muted engine tone which is actually quite nice to hear. Not sure if its because of the tires the road noise on the new one wearing Good Year's Assurance is almost non existent. I use to hear more of it in my old car which wore MRF. The facelift is still as exciting as the old one to drive. 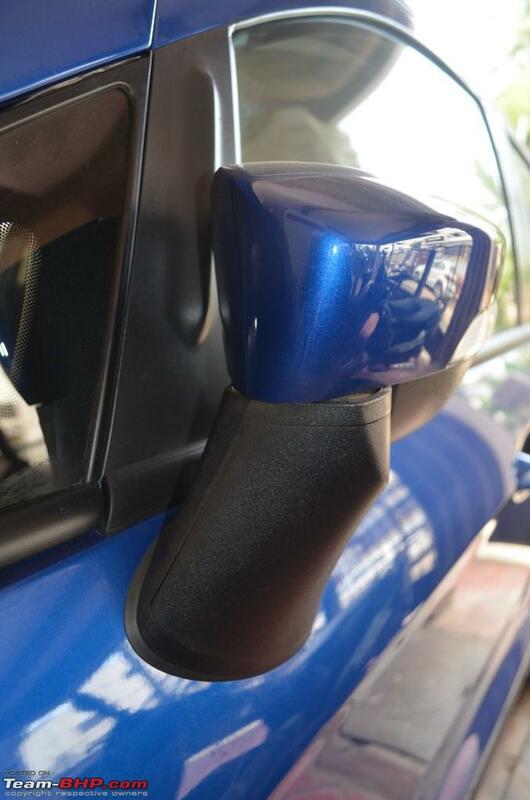 It smoothly sails through corners with very little body roll due to the higher stance and ground clearance. Though the suspension has been softened a bit, it cannot compare to the ride quality of the Nexon. You will still feel that the suspension is stiffer compared to the competition. What it looses on ride is compensated for the most part on handling making it a fun to drive. Having said that, the improvement on the ride on the facelift is very evident and the 16" wheels on the Titanium do work a wee bit better than the 17" ones on the Titanium+. Reviewers have mentioned that the steering slack has been increased but I have not felt any such thing. 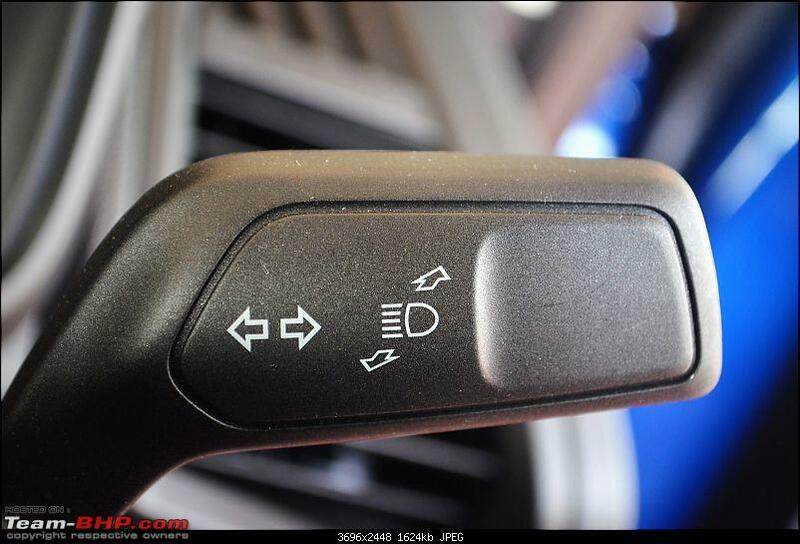 Within the city the light steering and the active return feature is of great use. On the highway too, its good and definitely better than the other EPS units on the competition. Braking is very effective and has enough bite. The car stops as you expect and the ABS aids it well. You don't really feel the need for the rear disc brakes as the braking is even otherwise very effective. 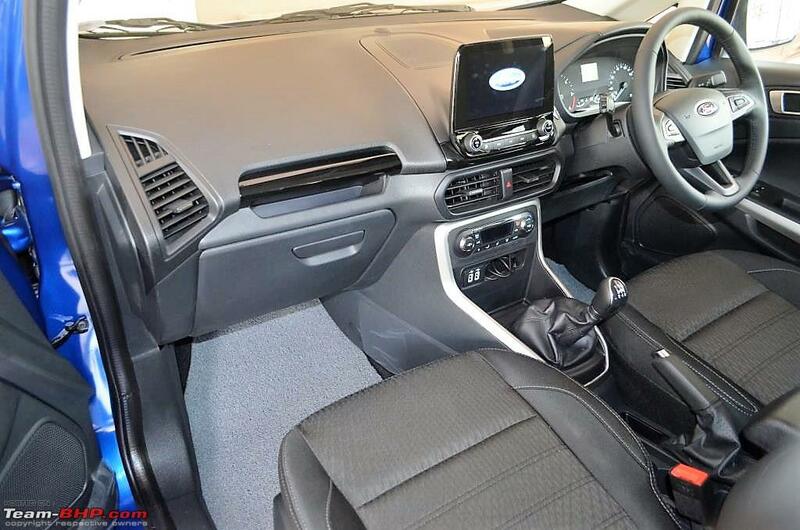 Though Ford calls it a 5 seater, it welcomes the 5th occupant with a squeeze. 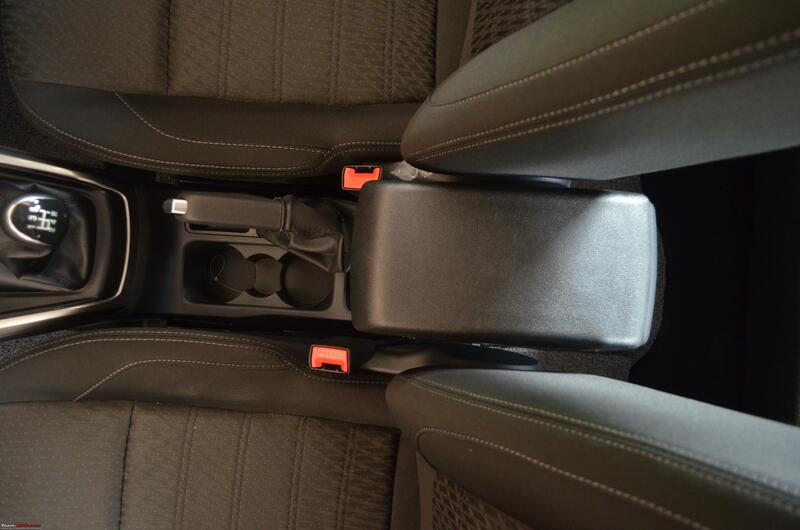 That said the improved seats have added lot of comfort and the under-thigh support is awesome. 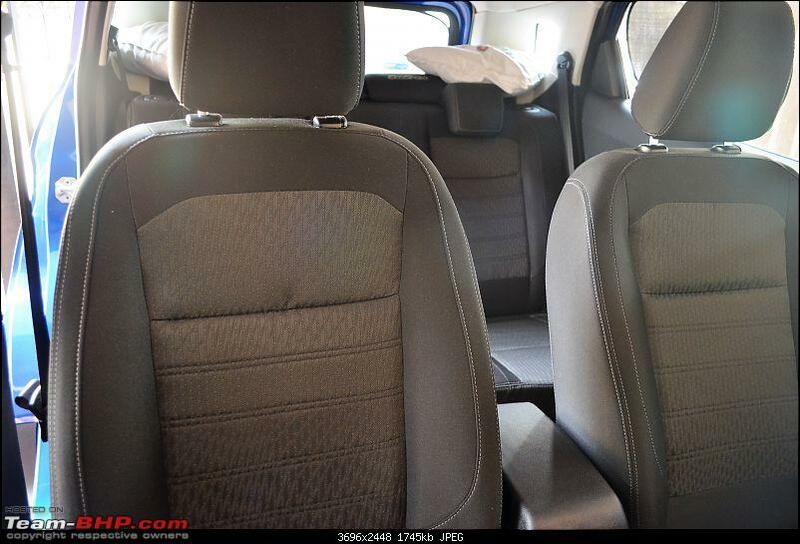 The seats are wider and are well contoured. The cushion is also firm to make you comfortable on long rides. 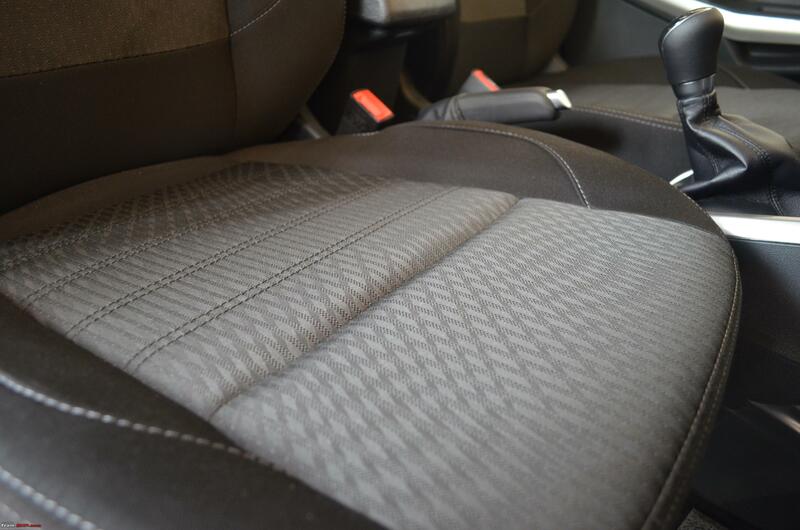 The fabric covers are of good quality and being a dark shade haven't opted for a seat cover. 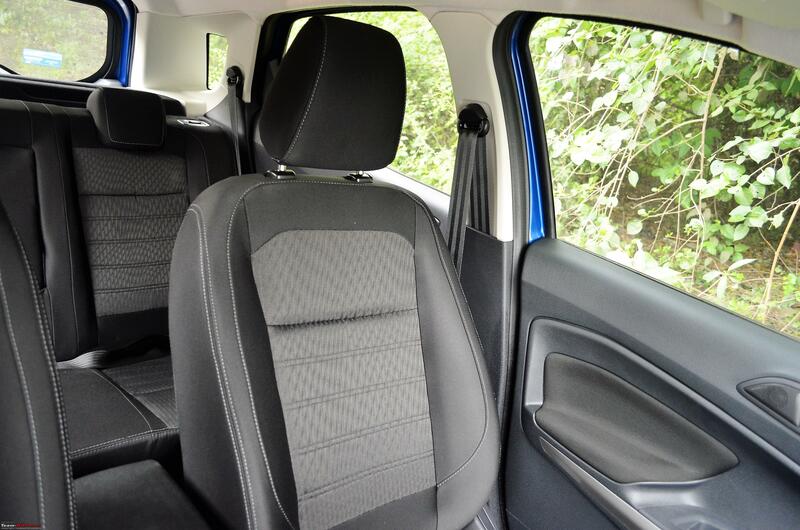 The high seating gives to you a commanding view of the road a head and with the help of the seat height adjustment and the tilt and telescopic steering getting into a comfortable riding position is easy. I track mileage with my mobile app and my old Ecosport gave an average mileage of 17.3kmpl for the entire 57000+ kms I drove. The mileage on the new one is not yet settled and the average so far for the 500 kms I have driven is 16.4 kmpl with 90% city drive. For the records, I usually prefer to drive with a light foot and hence my city mileage hovers around 16.7 - 17 kmpl while the highway mileage varies. If driven within 90 kmph you are sure to get 20.5+ kmpl and if you are doing 90 - 100 kmph it will get around 19 - 20 kmpl. Beyond 100 kmph the mileage drops drastically and the lowest I got when I drove north of 120 kmph for the most part was 16 kmpl. To me this is a good mileage and am super happy about it. When I first decided to buy a Ford there was lot of people in the family warning me about the high maintenance cost. Well in reality, I have not really spent much on maintenance. You may refer to my maintenance cost post on my old car for reference. If you choose just the periodic maintenance plan you would be sending around Rs. 5,000 - 6,000 on an average for every 10000 km service including the wheel alignment and balancing cost. I had to only replace my wipers and battery in my old car in the 4 years and 57,000= kms of use. I rotate my tires every 10,000 kms and only do a 4 tire rotation. Also, I do not do the wheel alignment / balancing at the dealership and would prefer an authorised MRF / Bridgestone outlet. The best part is that they offer a free alignment check after 3,000km from your visit. 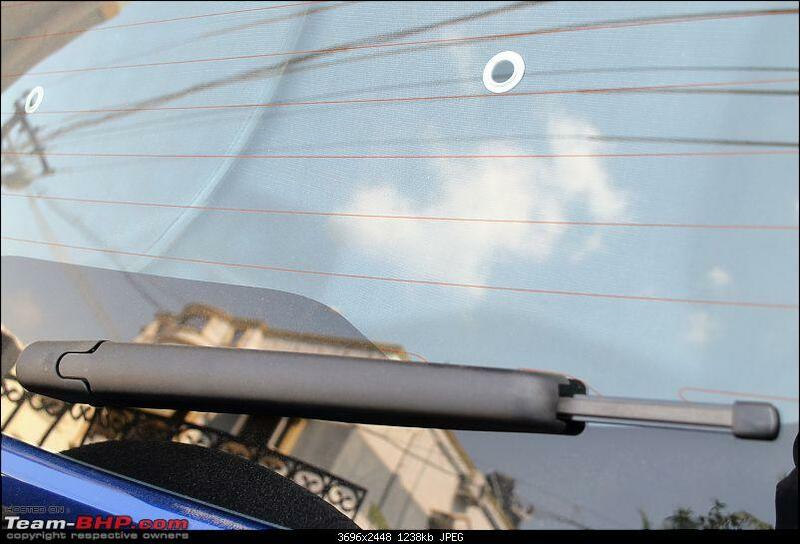 The MRF rubber on my old car which my brother is using now has done ~ 63,000+ and will still go another 10,000 km. That's a good mileage for the rubbers. The after sales service has been awesome for me and I service my car at Chennai Ford only. The only thing I stick to is to the quick service and try to stay at the dealership till it gets done. I have not been conned so far but that might also be because they know me well. I normally go through the periodic service schedule in the manual to be aware of what needs to be changed. But overall, my experience with the dealership has been good and that's another reason why I opted to go with them even while I have another dealership closer to my home. The projector headlamps has improved the low beam light spread. The high beam is yet to be tested well on highways and shall update on it later. However, keeping the fog lamps and the high beam on is more than sufficient for me. This is based on a short 45 min drive on the highway. Performance in rainy condition on the highway is something to be tested yet. 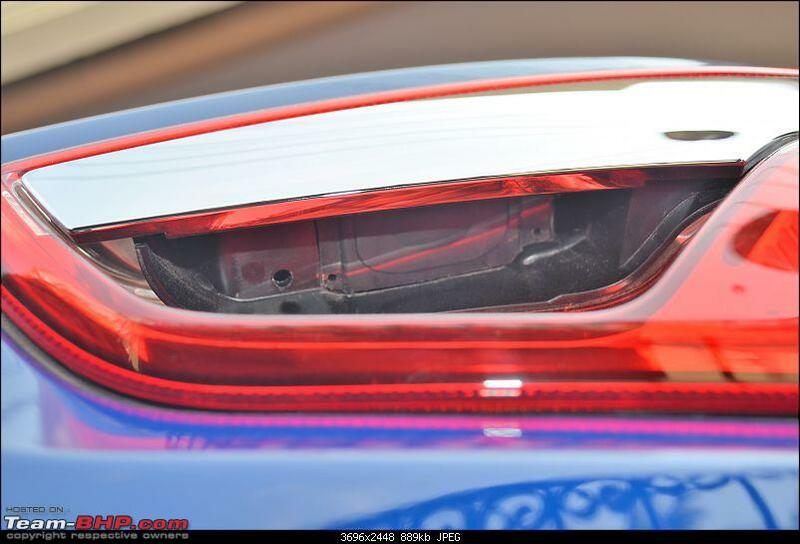 Both the rear fog lamps light up unlike some cars where only one works and the other one is a dummy or does not have a bulb. 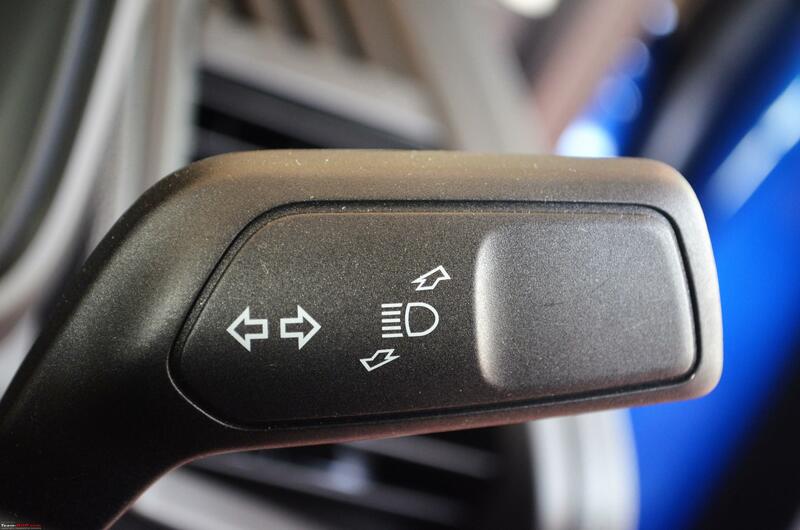 This aids in reversing in the dark. 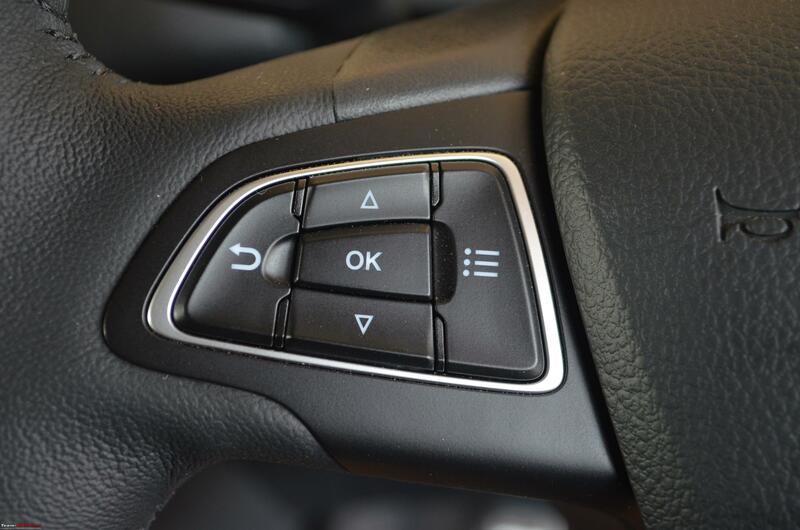 As in any Ford, all switches on the inside are illuminated and easy to identify in the dark. 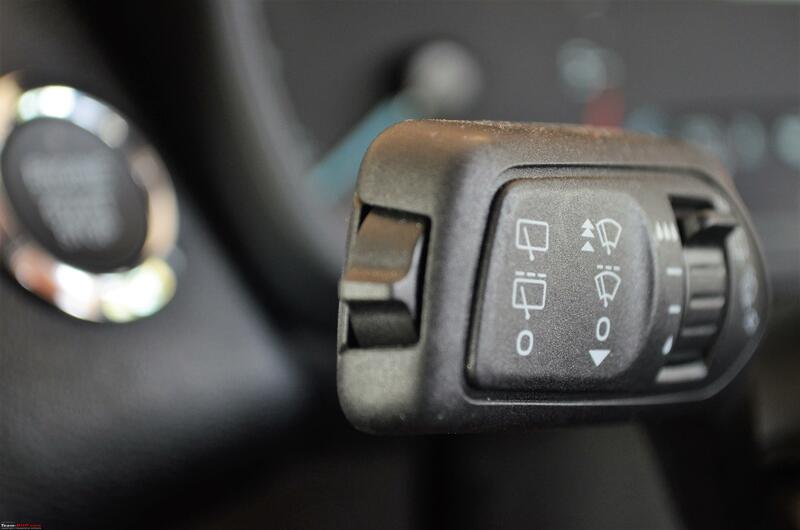 There are enough light points inside like the individual reading lights for the driver and the passenger, the common front cabin lights, the light for the passenger vanity mirror, rear cabin light and the boot lamp that turns on automatically if the boot door is kept open. The puddle lamp though small lights up the floor really well and is a nice addition on the facelift. 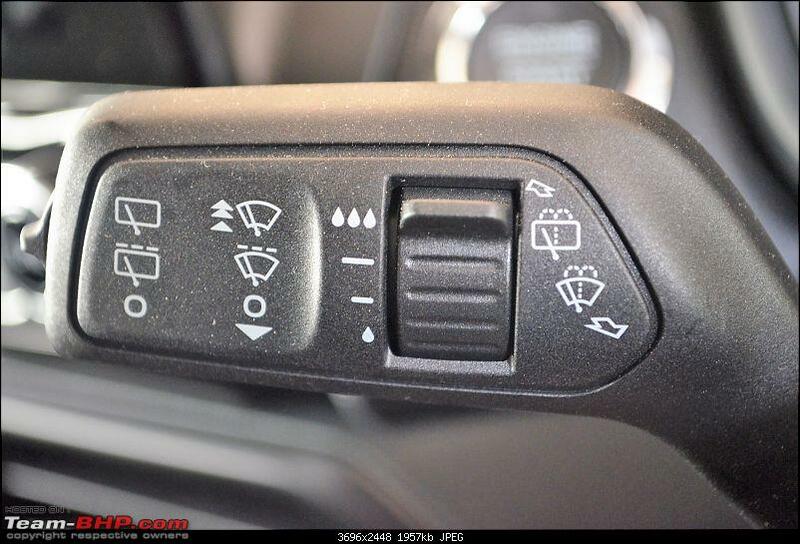 These are simple but nice features to have on your new car. 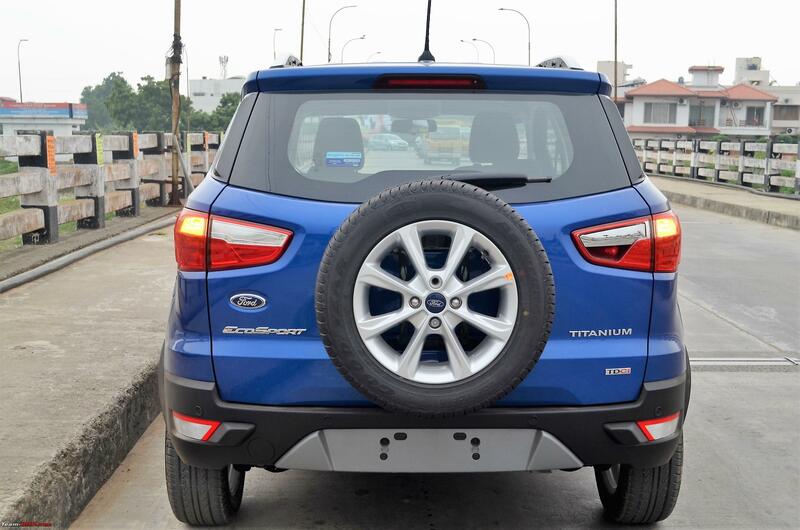 IsFords are known for their robust build quality and the Ecosport remains true to the DNA. It will be evident and you will feel secure once inside the cabin. 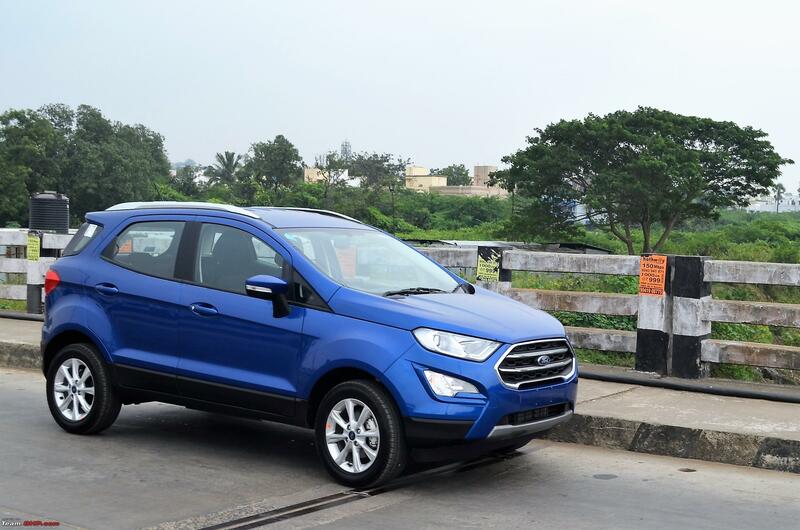 This is one strong point to consider the Ecosport over the competition too. 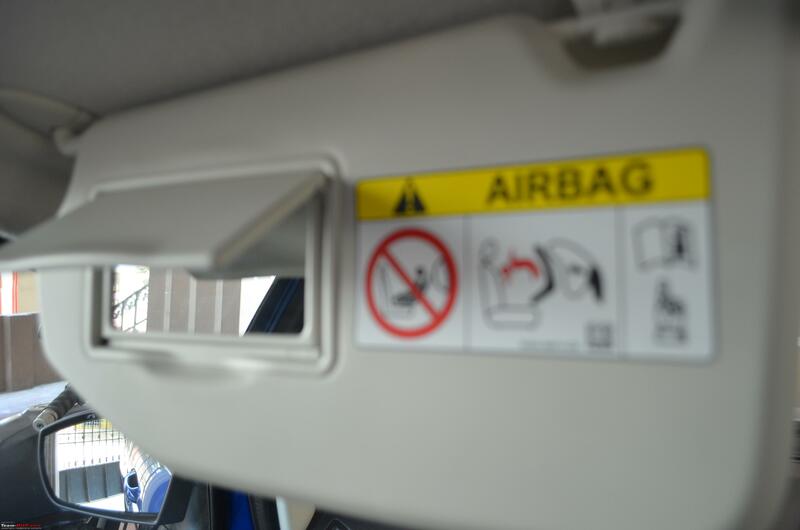 A few interesting facts on the safety element of the car. The doors and the body in general feel robust and the doors shut with a nice thud. 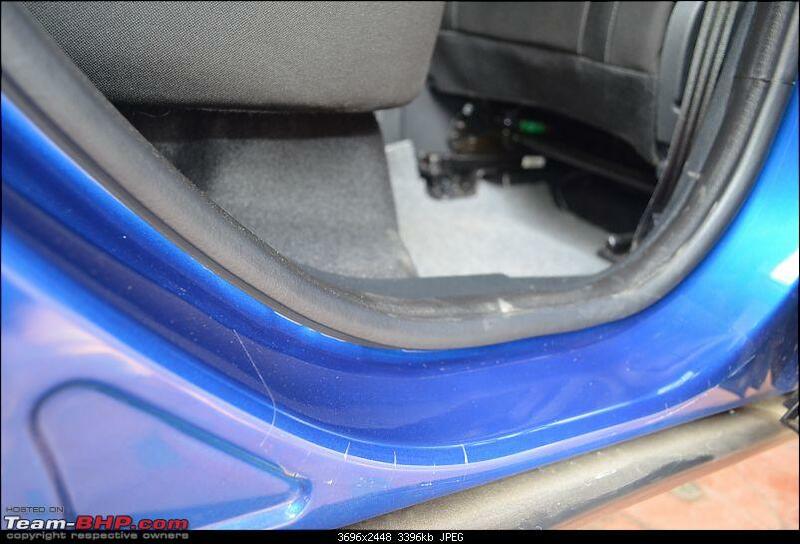 Airbags and ABS are standard fitment. Titanium+ gets Traction control and 6 Airbags. Ford has heard you! When the car is running and you CLOSE THE DRIVER DOOR and walk out with the key in your pocket the horn sounds twice to remind you that the key is not inside the car. This only happens when you walk out and the driver door is closed. 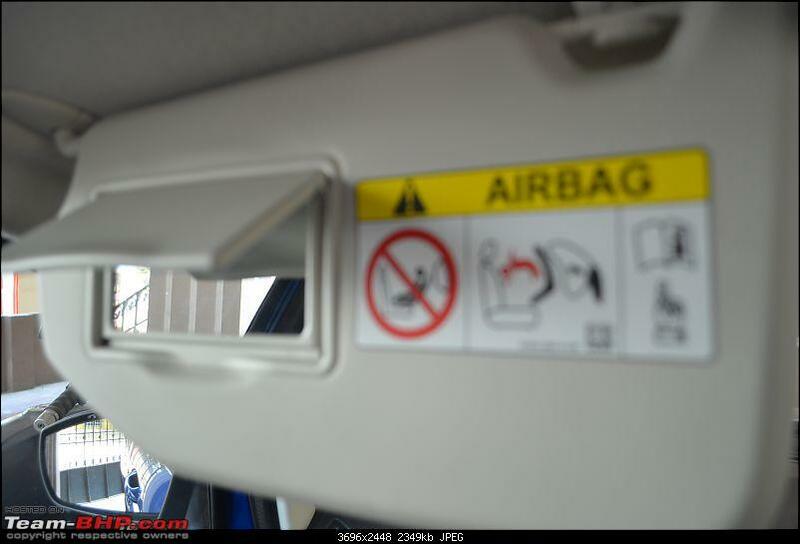 When you do the same thing keeping the driver door open, this does not happen and only the door open warning sounds inside the car. Now that's a nice touch! 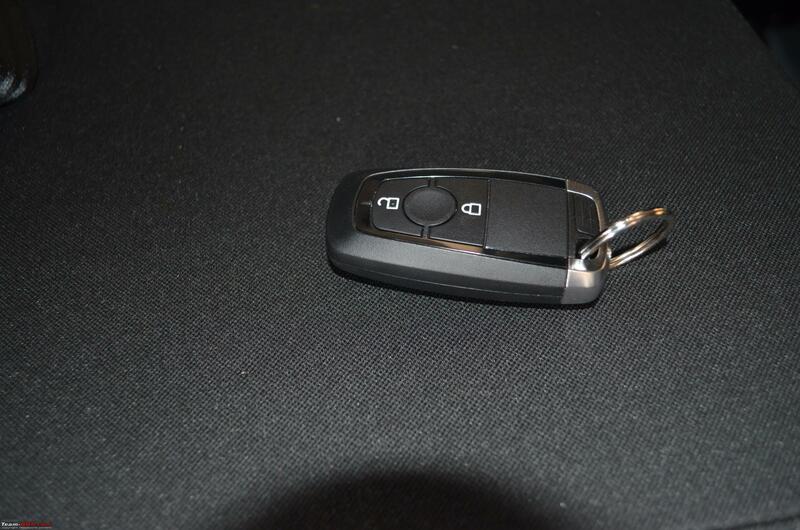 You cannot lock the car using the capacitive touch with the key inside the car. 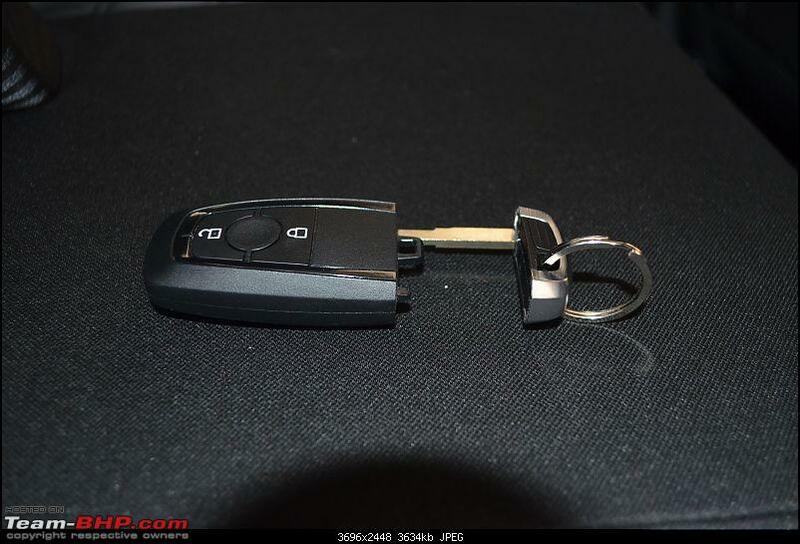 So no fear of locking with your keys inside the car. Ford knows that 'We the people' sometimes tend to TYPE on the move. To avoid that, when connected to Android Auto, you cannot search for your destination while the car is moving. Not even the passenger can do that as it actively prevents that by displaying a warning sign asking you to park the car and try that. SUPER COOL! So next time you want to set your destination, do it before you start / do it while idling. 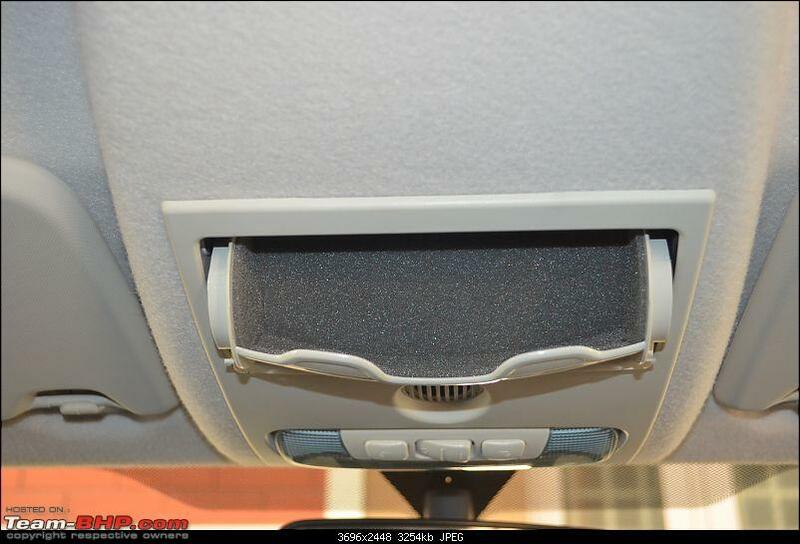 The seat belt warning starts to beeps if the driver is not wearing it and has moved the car. 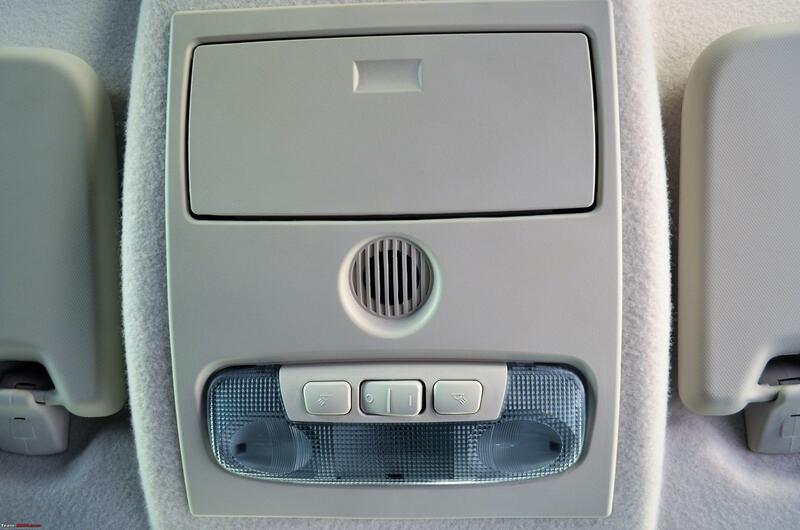 The frequency increases and is annoying enough to make you wear the seat belt. Good to have a strict car that makes you follow the rule. 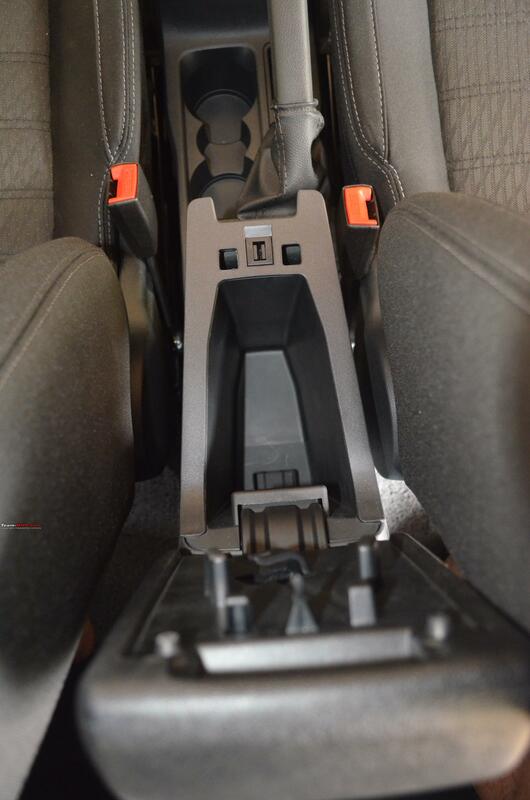 ISOFIX is only available in Titanium+ variant and I expect that to be made a standard fitment. Overall, the new facelift still carries the charm of the outgoing model with some very useful updates. I am very happy to have put my money on this machine and am convinced this is the best bet in the segment. Shall try to keep this thread updated with my observations and experiences. Last edited by Jude300 : 17th January 2018 at 09:35. Rating thread 5 stars . Your report is going straight to our homepage too. For a second there, I thought I'm reading an Official Review. Thank you for the terrific attention-to-detail and candid feedback on the car. It's ownership reports like these that make Team-BHP the special place that it is. 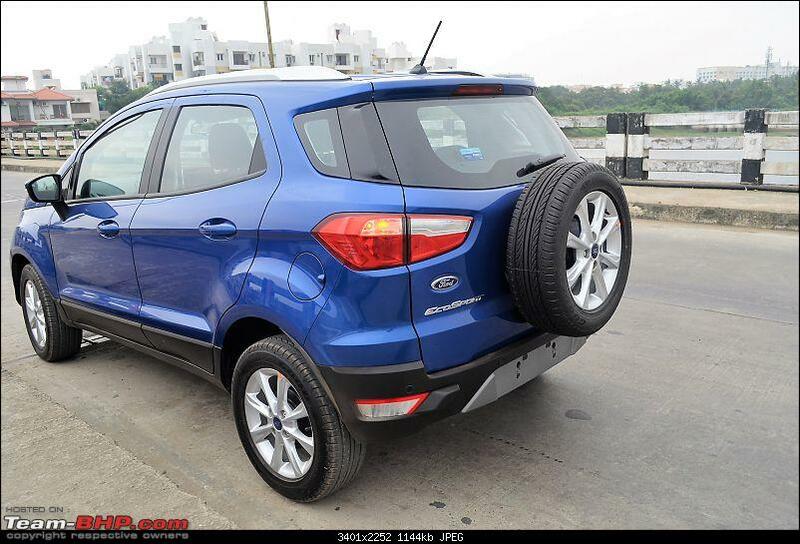 I always loved the EcoSport and like it even more with the new updates. While we test-drove the petrol (link to petrol review), it's this 1.5L diesel that is indisputably the superior. Congratulations & wish you many years of smiles. Nothing speaks for a car more than a repeat customer . You put your money where your mouth is....twice. Last edited by GTO : 17th January 2018 at 10:07. Timely addition to the review portals, since the official review addressed only the Petrol model. 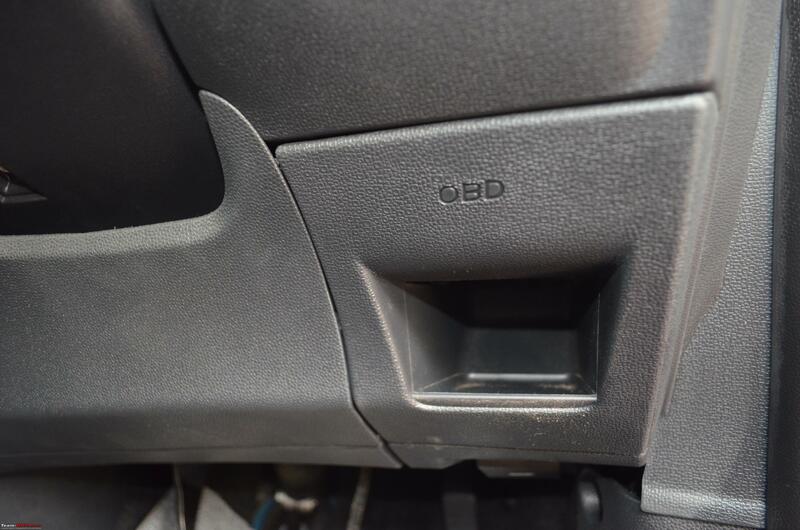 Good to hear that the diesel remains the engine of choice for the keen drivers, and even more pleased to hear from your earlier experience that the TDCI engine is reasonably priced as far as maintenance is concerned. The figures of Rs. 5-6K annually that you quoted is more or less the same that I spend on my Swift and Brio on an annual basis. One question though- prior to 1750 RPM, i.e. before the turbo kicks in, what is the drivability like and is there significant turbo lag? Last edited by arindambasu13 : 17th January 2018 at 10:27. Congratulations! And thanks for sharing your comprehensive review. Just when we have the official review of the Petrol variant, you came up with this well-written review of the face-lifted diesel; great attention to detail indeed. It all started in 2013 when I first fell in love with this so called Urban-SUV. I have upgraded to the Titanium variant of the 2017 facelift. The Ford diesel is very driveable even below 1750 rpm. Its quite linear, which makes it comfortable for puttering around. The turbo surge when the boost kicks in is not as sharp as other diesels (like the 1.3 Fiat or older Hyundais), but comes in very positively. My dad drives a diesel EcoSport in the Nilgiris hills, and he's happy with it. The only time you have to rev it is when you're starting from standstill on a steep slope. All the other times it feels extremely natural to drive. I own an EcoBoost, and having driven both, I started advising people to look at the diesel, as that is an all-rounder everywhere - in the city, highway, etc. Congratulations on your upgrade, Wish you many happy miles. I would also like to thank you for the noodle mat video. I am confused if i should get a ready made one for 1500 or make it myself. Congratulations Jude300 on your purchase. Ford has again upped the game and has the most desirable & complete CSUV in the segment. Another point worth a mention is that Ecosport is a global product unlike some of the competitor's "made-for-India" alternatives. 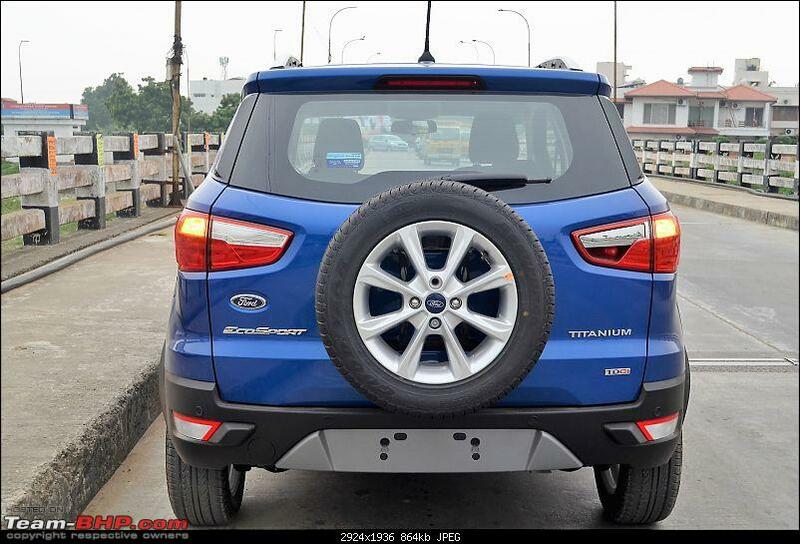 Wish Ford all the success with the new Ecosport. Congratulations on your latest acquisition! Reading your report, especially on the driveability aspects only reminds of my Bangalore-Mumbai drive in an Ecosport (90 Bhp) last month where I drove the entire length except around 100 kms that my friend did. 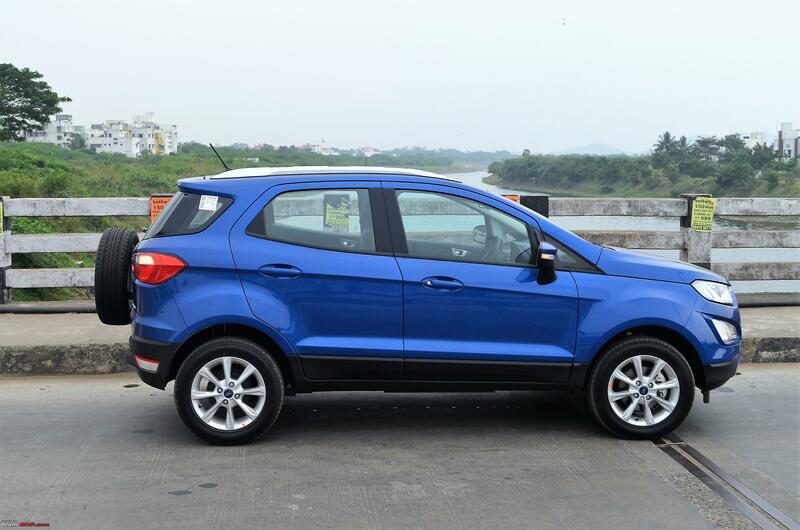 I had earlier driven my colleague's Ecosport and had loved driving it but the last one that I did had a sample of ~1000 kms that I couldn't resist talking about it here. NVH and Road manners are the 2 most important elements that I liked about - The Engine and Wind noise is well controlled. The suspension although a bit firmer is perfect for highway drives under loaded conditions, more so if you want to take over uneven undulations at higher speeds, it manages to stay stable. The Engine characteristics makes it exhibit a very linear performance that at every moment you feel I will feel the surge now and that doesn't happen . I guess its the case of getting used to other Turbo Diesels and accepting that this is how beautifully linear a Ford Motor is. Would love to drive around the 100 BHP avatar soon and compare that to my earlier experiences. I would also love to know more on the FE front since this is 100 BHP. The one we drove to Mumbai ended up with 13.6 on the MID at the end of 965 Run after reset. But our speeds were mostly 120 KMPH all the times and then I checked with Viddy who confirmed that this is what one can expect out of the Ecosport. Again, before I forget, on 2 lane roads during overtakes, although there is enough power on tap, it is the lag around ~2000 that irked me till I got used to it. I guess its the matter of driving it on regular basis and you know where to extract the maximum out the Power-Torque band. Wishing you all the best with your Ecosport and happy mile munching! Last edited by paragsachania : 17th January 2018 at 13:26. 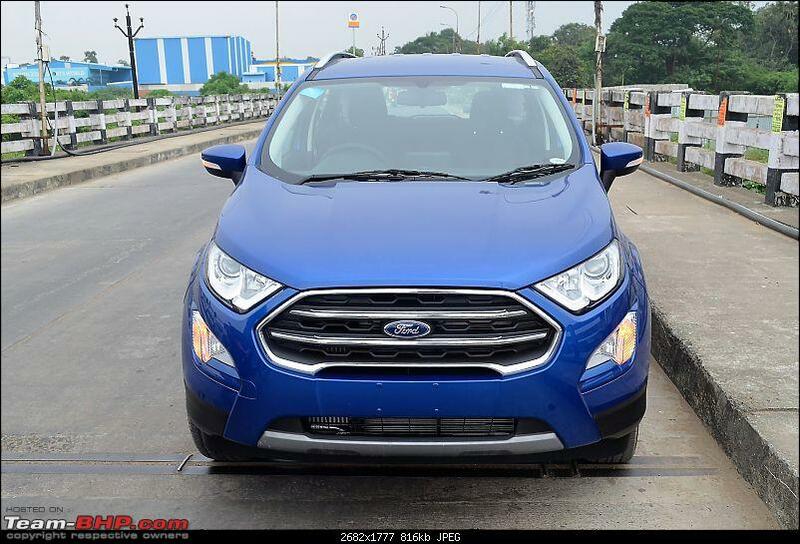 I always have a leaning towards the Diesel engines for its torquey nature and the Ecosport has it in abundance though a bit pricey but justified by the features it possesses now. Very neatly written down review which is at par with the official ones out here on the forum.